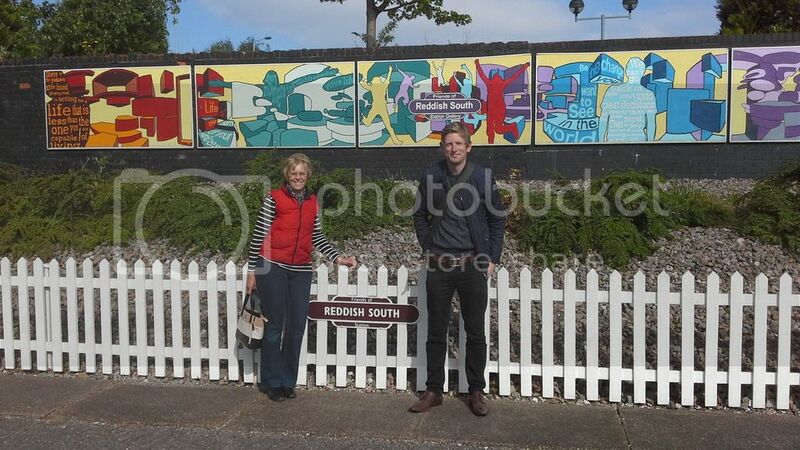 Welcome to the Friends of Reddish South Station website. It is with regret that we will no longer be able to update this website due to serious technical and funding problems as we cannot afford to pay the licence to show any photos ever again. This is such a shame as we had a great recorded history in photography for Reddish South but these photos are now locked away from us. However we do have an updated TWITTER page on FoRSS. 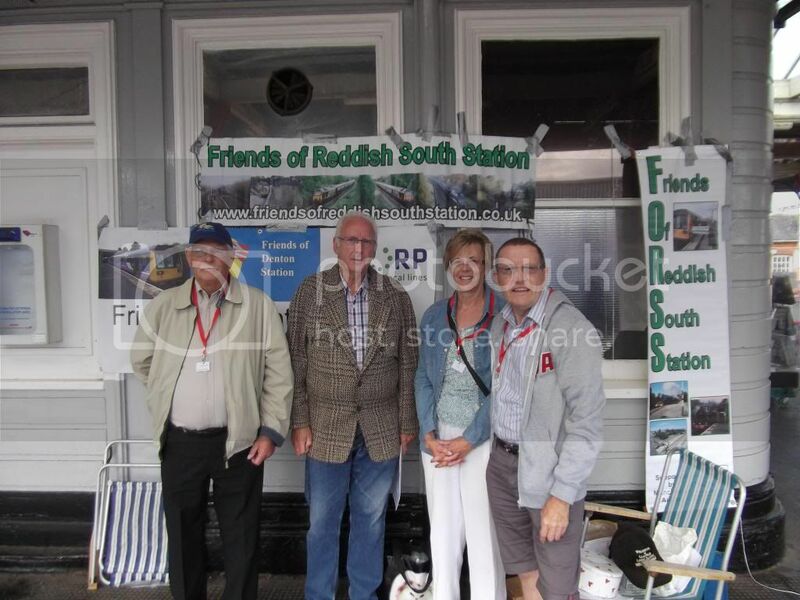 We also publish a superb and regular newsletter which can be e-mailed to you if you join The Friends of Reddish South Station (FoRSS) Details from davdot@sky.com. 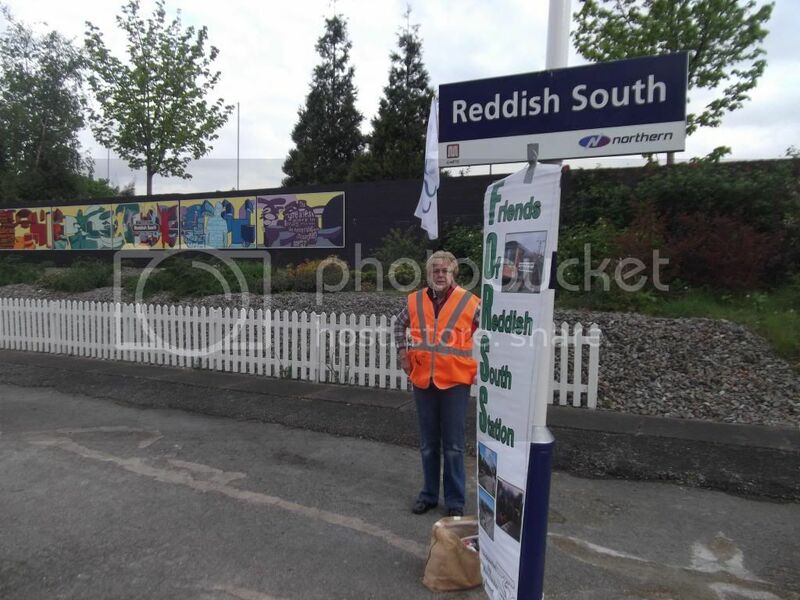 This site will keep you updated about the progress of the recently formed "Friends Of Reddish South Station" group that aims to tidy and maintain the little used station. Its long term aim is to fight for the introduction of a regular service to Stockport and the south and Manchester Victoria to the northwest. Our main point of contact for news or official items is the Secretary FORSS, e-mail forss1@ntlworld.com and we also have a secondary e-mail address for photos davdot@sky.com. If you have any photos of our recent events or special trains, please forward them to this address and we will try to include them on our pictures page. We are also on "Twitter" @DavdoFo . Treasurer Dot and Technical Advisor Noel along with Friends of Denton Station Officials FoDS, had a great meeting today chaired by MP Andrew Gwynne, with TfGM Officials Amanda White & Jason Prince. Of course our joint aim with FoDS has always been to get passenger services along the line from Stockport to Manchester Victoria (and beyond both ) through Reddish South and Denton Stations. Our joint surveys have always shown that many hundreds of people want and need this alternative route to Central Manchester and these include hundreds in the Hazel Grove, Middlewood, Cheadle Hulme & Stockport areas as well of course as thousands in Reddish and Denton. The survey results proove all this. Unfortunately despite continued support and pressure from several MP's, many Councillors from Stockport and Tameside MBC'c and both FoRSS and FoDS it has always been TfGM that have not reponded to all this effort , pressure or any survey results. So it was very refreshing indeed that today both Amanda White and Jason Prince from TfGM accepted that we had indeed had many meetings with Arriva North Trains and Network Rail and that both of these parties had been very positive for services along our line. Therefore they both agreed with Chairman Andrew Gwynne MP that we ALL need to meet together to further this progress to getting them. So it was agreed by all to meet again in May with Arriva North Trains and Network Rail. This meeting will be arranged by Andrew, probably at TfGM's offices in Manchester and of course Amanda and Jason agreed to this. This is at last some positive progress and we now feel that we will be listened to and that passenger services to Manchester Victoria would aleviate some of the chronic road traffic problems in East Manchester. Stephen Forde Stockport MBC Community Rail Officer presented the members who were on the Station platform today, tidying and gardening, with our Best Kept Station award totem that will get pride of place on our picket fence. 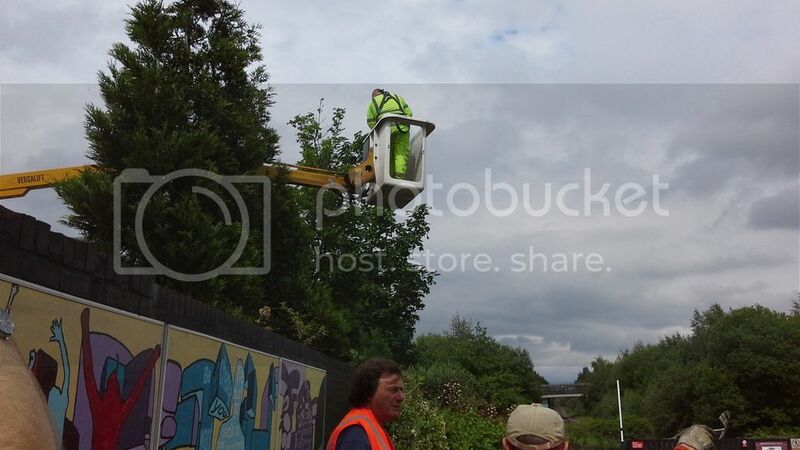 It was a gloriously sunny warm day and we got lots of support with all our gardening and weeding and as well as getting our award we also got several local Councillors and even James Palmer the boss of Retro Railtours of Ashton u Lyne, who got stuck in with some much needed pruning. Our Head Gardener Noel doled out the jobs and appropriate tools, and we got lots of work done in bringing down loads of cuttings and weeds. At about 11:00 Dot and Kim went to local cafe "Johnnies Cafe" on Gorton Road for the usual bacon and sausage butties and Dave brewed up for all the crew . It was a great morning for gardening and some quality "networking" in our continued campaign for passenger services from our Station and from Denton Station too. We also managed to convince a few more people that the next Retro Railtour from Reddish South to Cardiff/Swansea will be worth going on ! MANY THANKS to everyone who turned up to help. March 20th. Please see news page for latest Retro railtours trips from REDDISH SOUTH ! March 20th 2017. Folk Train News ! This years Easter Folk Train will be on Good Friday April 14th . It departs Stockport 09:20. Reddish South 09:27 and Denton 09:31. 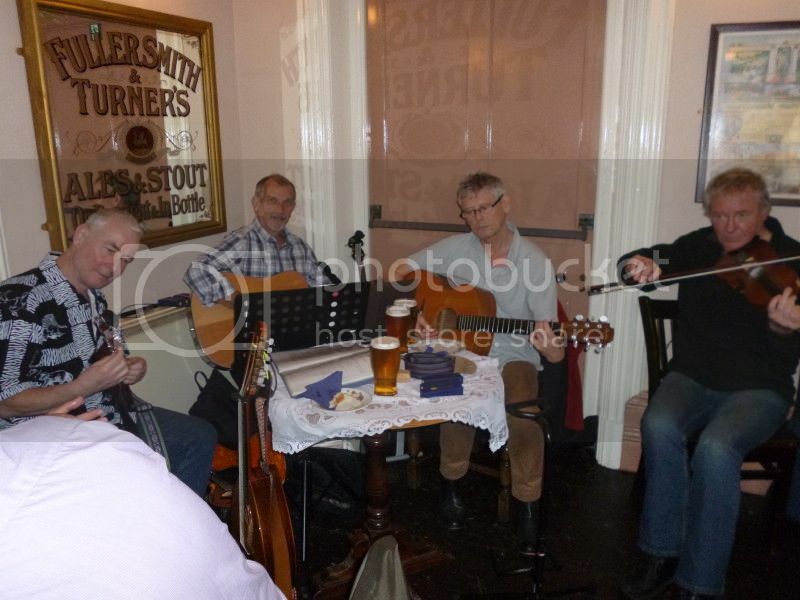 Ged and Phil our resident Folk Duo will be playing on the Train and in the famous Stalybridge Station Buffet Bar. The buffet will be opening specially for us, serving breakfasts teas coffees or bacon butties etc. Please don't forget that the Train is ONE WAY ONLY and you have to make your own way home. Feb 3rd 2017. Ghost Train. Todays train alone got 11 passengers from Reddish South with a further 3 from Denton. There were also 17 already on the train from Stockport. Bearing in mind that this Parliamentary "Ghost Train" only goes one way to Stalybridge once a week, and not to Manchester Victoria, then this shows for one, that the passenger figures for a full year from TfGM are way out , and secondly that there are plenty of residents in both Reddish and Denton really would support a proper passenger service to Manchester Victoria that TfGM will simply not recognise or acknowledge. FoRSS have been awarded a prestigious ACoRP Community Award at the Cheshire's Best Kept Stations awards night. The presentation is pictured here but you have to use the scroll buttons to view it in full. We are trying to reduce the size to fit the web page but are having technical problems at present. Last nights AGM was well attended despite the constant drizzle and strong winds in Reddish. There was no great positive news about our campaign for services but Noel our technical expert has had several meetings and presented some superb reports to all the various people we need to get on our side and he is optomistic that we could get a service "by default" as several trains in the next timetable changes will be terminating at Stockport because Manchester Piccadilly is at total saturation point and passengers for Piccadilly will have to change at Stockport just to get there ! Therefore we may be able to get the authorities concerned to allow these terminating trains to continue along our line to Manchester Victoria (and possibly beyond) intead. We already know from many surveys that people do actually want services to Victoria as that area of the city is now the actual heart of Manchester , for work, leisure and shopping. 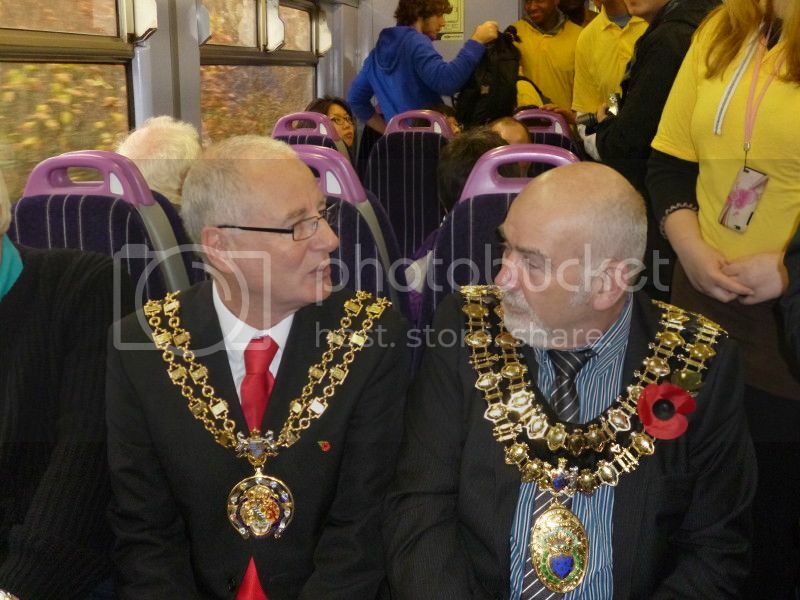 Also Chairman Cllr Tom Grundy was hopeful that if Andy Burnham becomes Mayor of Manchester he will lend his considerable influence to our cause as of course public transport from the east side of Manchester is definately lacking by train and is overcrowded by road. So nothing definate yet , but promising. All the present Committee were re-elected and it was proposed and seconded that Keith Chapman a dedicated member should be voted in as Vice-Chairman as the post was vacant. It was reported by various members that we are doing very well with publicity, via the Radio, TV and on Twitter , and our Facebook page (not updated for many years) will now be taken on by Secretary Kim Burrows who has the necessary social media skills. Thanks Kim. It was noted that beacuse of our Paul Merton TV appearance that there was a huge surge in passenger numbers on the weekly Ghost Train and we even got one all the way from the USA because of it. We also had people from Oxford, Bristol and The Orkney Isles amongst many other places and lots of them on bikes too. So the publicity does work. RetroRailtours have promised us another railtour this year after last years fantastic "Canterbury Belle" so PLEASE watch their official webpage for excact details but PLEASE try to book from Reddish South, as we need more passengers from our Station ! Retro will be making an announcement very shortly ! Also it was confirmed at the AGM that this years first FOLK TRAIN will be on Good Friday April 14th leaving Stockport 09:15, REDDISH SOUTH 09:27 and Denton 09:31. Music on the train and in the famous Stalybridge Buffet Bar which will be asked to open early again to provide bacon butties, breakfasts and teas etc etc. Come and join us. But remember that its ONE WAY ONLY ! 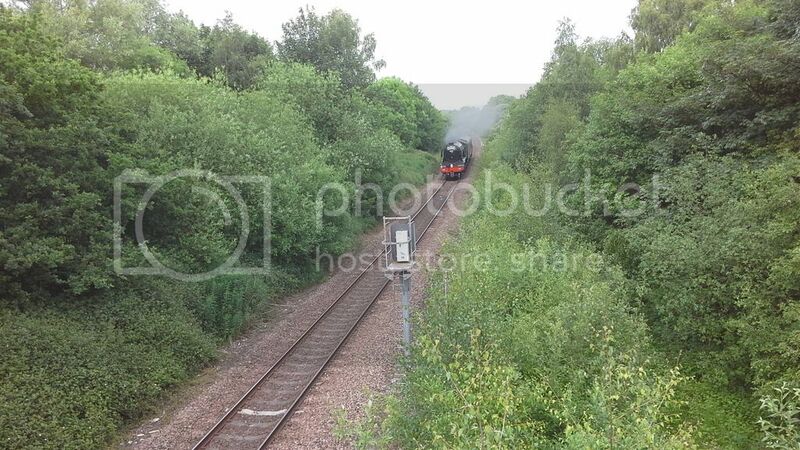 Historic loco to pass through Reddish South. ! ! On Sat February 4th this Standard Class 4MT steam locomotive will be passing through Reddish South on a "Buxton Spa Express" railtour. The loco was restored at the North Norfolk Railway in 2013 and it was restored to full main line standard , meaning that it is now able to haul main line passenger services as well as running on preserved lines such as the North Norfolk and East Lancashire Railway or any other one. Our Stockport railway expert Mel Thorley tells us that this special railtour will be the first time since 1949 that this loco has hauled a passenger train and that it has taken over £750,000 to fully restore it. If you want to ride the tour around Lancashire and Yorkshire then to Buxton and back to Manchester Victoria, full details can be found on "The Railway Touring Company" website. Nov 16th 2016 Railfuture Awards. We are very proud to announce that the friends group FoRSS have been awarded a "Railfuture" Commendation for our newsletter. Members Kim and Alan Burrows who compile the superb and very informative FoRSS newsletter, went down to Birmingham for the presentations . While they were there they managed to do some interesting and important "networking" with other groups and individuals and we made some great connections. 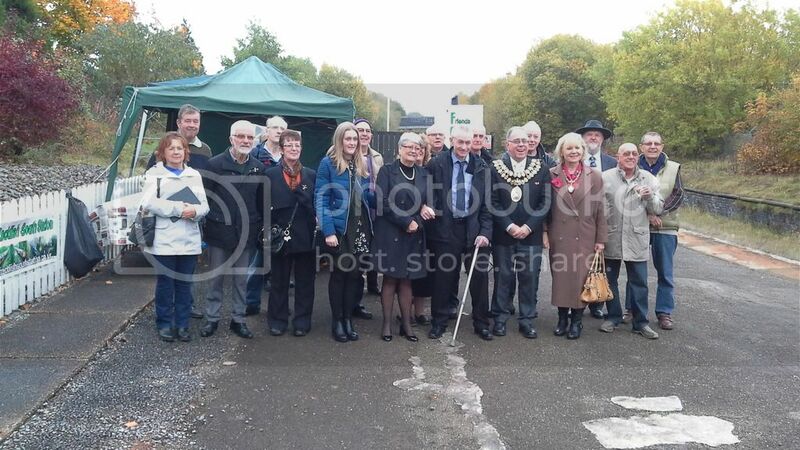 Oct 30th 2016 James Mills Memorial Plaque unveilled. 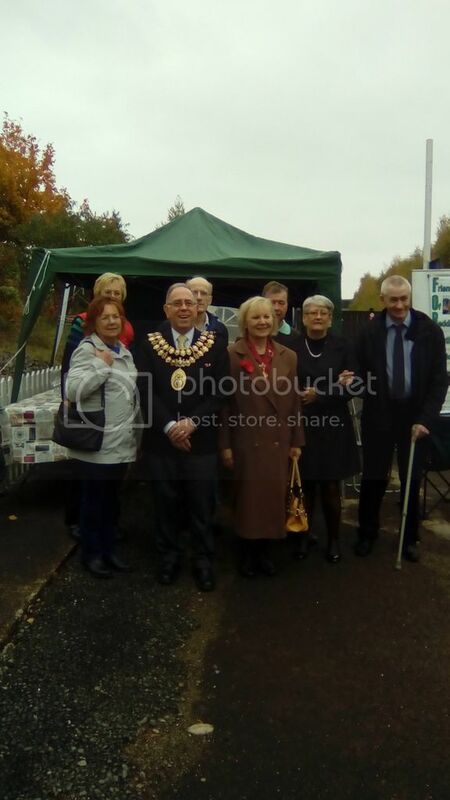 The Mayor of Stockport Cllr Chris Gordon and Lady Mayoress Dr Margaret Gordon were guests of the Mills Family of Reddish this afternoon, Sun 30th Oct, for the unveilling of a memorial plaque in memory of the late James Mills on the Station platform. James Mills was an outstanding railway modeller and collector of railway magazines, memorabilia and also a supporter of the work we do at FoRSS in trying to get a proper passenger service for the people of Reddish. The photos above show some of the many Mills Family , The Mayor and Mayoress, FoRSS members and several local Councillors who came along to the Memorial plaque unveilling today. The kind words spoken by Mayor Chris Gordon were a nice tribute to James Mills , who we at FoRSS are indebted to for his bequeath to us of many rare railway locomotive models and railway magazines that we have been able to sell for FoRSS funds. It was such a nice afternoon and we all enjoyed the little event and speeches and some snacks & drinks afterwards. Many Thanks to everyone concerned especially all the Mills Family. If you double click on either image above it will bring it up full page and by clicking your BACK button it will return you to this page. Next Sundays Antiques Roadshow "Golden Age of Travel" steam railway special on SUN 30th OCT will feature FoRSS Member Graham Kelsey. Graham who is an avid and expert railway memorabilia collector owns a very valuable Flying Scotsman plate bought many years ago when the famous loco was repatriated from the USA by millionaire Sir William McAlpine. It is a genuine Flying Scotsman plate and is now after many years and much publicity for the worlds most famous steam loco, very valuable and it will be very interesting indeed to find out exactly what is worth next week. 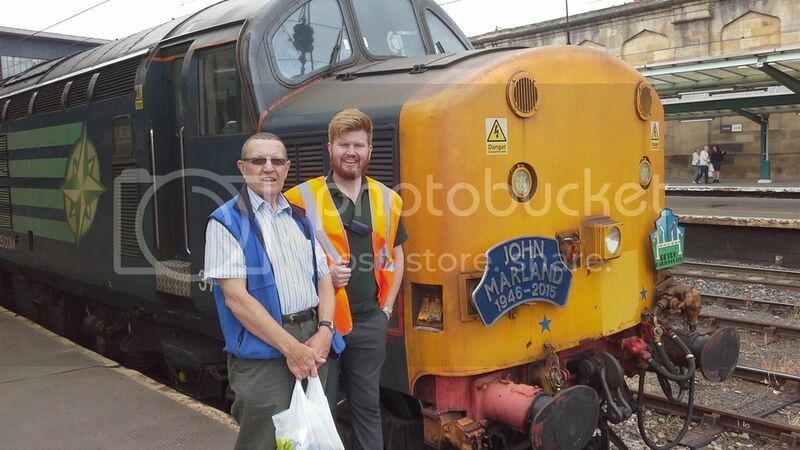 Graham pictured below at this years Stockport Station railway show with organiser Nick Abblet of Virgin Trains, was treated by the BBC to a trip behind the loco from Carlisle to York and was filmed on board while his plate was valued by the experts. As it was all very secret from the day of filming in summer we are not sure if it is a nameplate, shed plate or number plate, but knowing Graham and his collection it will be something very worthwhile.! The show is on BBC 1 at 8:00p Sun 30th Oct .
WOW. That show has just been broadcast and Grahams original front number plate from the Flying Scotsmans smokebox has been valued by expert Paul Attenbury at up to £20,000. WOW ! Oct 9th. Denton West End Club. 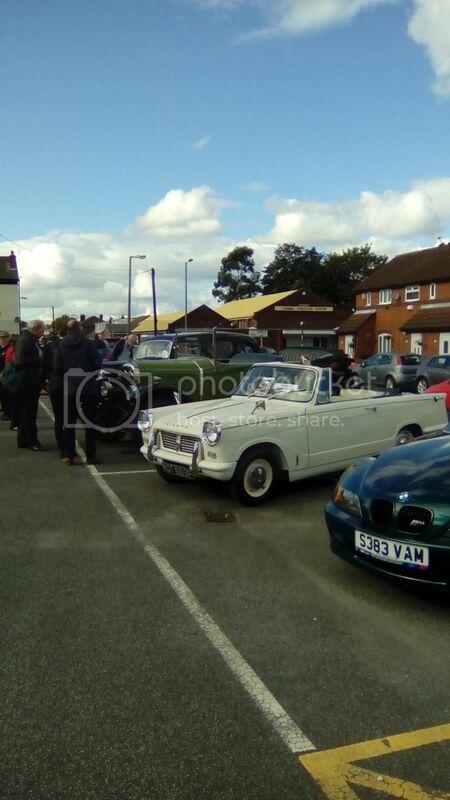 We joined FoDS the Friends of Denton Station today at this fantastic club in Denton Manchester for their 120th Anniversary show and exhibition which featured trade stands, craft stalls tombollas and even a classic car show outside on the huge car park. We had a joint table with our pictures and displays and we had a great day with lots of support and interest. Again local Denton and Reddish MP Andrew Gwynne came along to support not only FoRSS and FoDS but the Denton West End Club who have been established now for 120 years. Brilliant news today. The money has all come in for the Macmillan Cancer Charity day at Reddish South Station and later at Stockport Labour Club who sold the last few remaining cakes and jams at their "Quiz Night" and the Grand Total is £330. The cheque has now been sent off to Macmillan for this great amount. This shattered last years total and is a reflection of the generosity of the people of Reddish, Denton, Stockport and beyond. 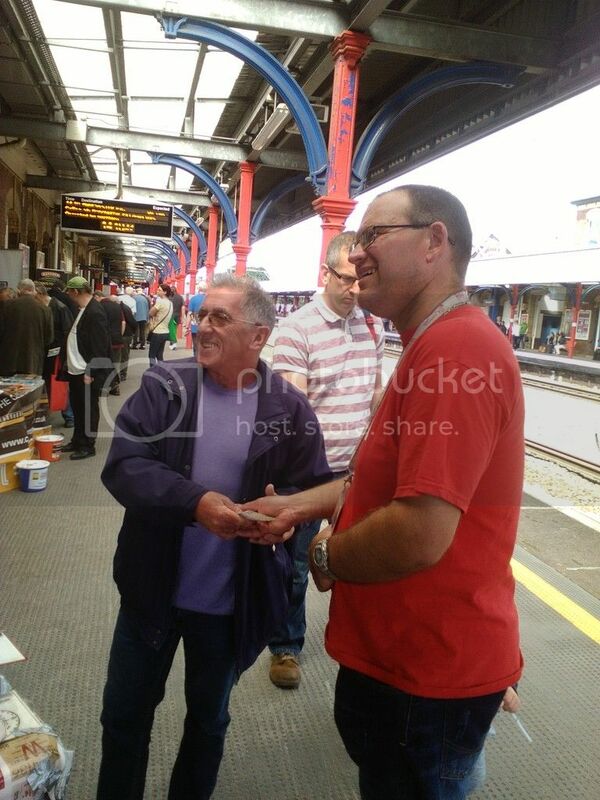 We even had a donation from a couple from St Albans Hertfordshire who were riding the "Ghost Train" on Friday . About 8 trains in total passed through the Station while we were holding the coffee morning, so why not come along next year on the "Ghost Train" from Stockport, stop off for a brew and a cake and do some very different train photography or "spotting" and then catch the bus back to Stockport. Remember , our train is once a week and ONE WAY only ! 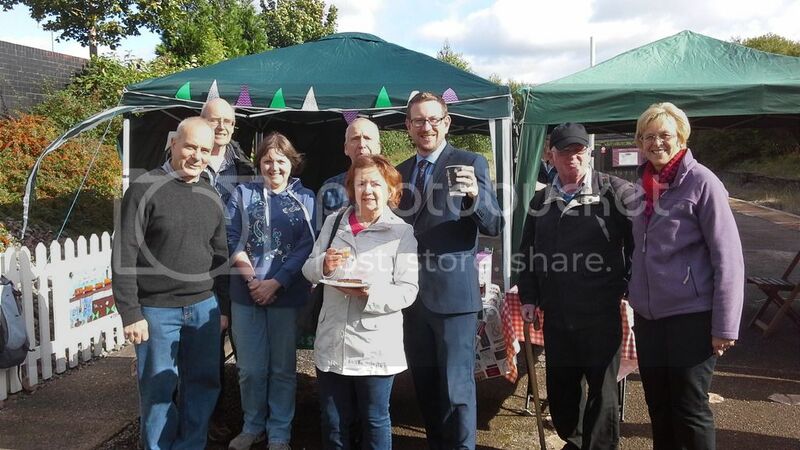 "Friends" Councillors and MP Andrew Gwynne at our Macmillan Coffee morning. The train this morning had lots of passengers from Stockport, Reddish South and Denton, which was probably due to our Twitter Page, the Paul Merton "Secret Stations" show, the "YouTube" images of American Stock Car Driver Jamie Pfeifer doing a double roll over in his recent race at Coventry Stadium, and the new Pokoman game that now features a virtual image of Reddish South or so we are told ! Anyway special visitors this morning included 2 enthusiasts aiming to visit every station in Greater Manchester, who had rode their push bikes up from Cambridge to visit us, and 2 more dedicated enthusiasts from THE ORKNEY ISLES. 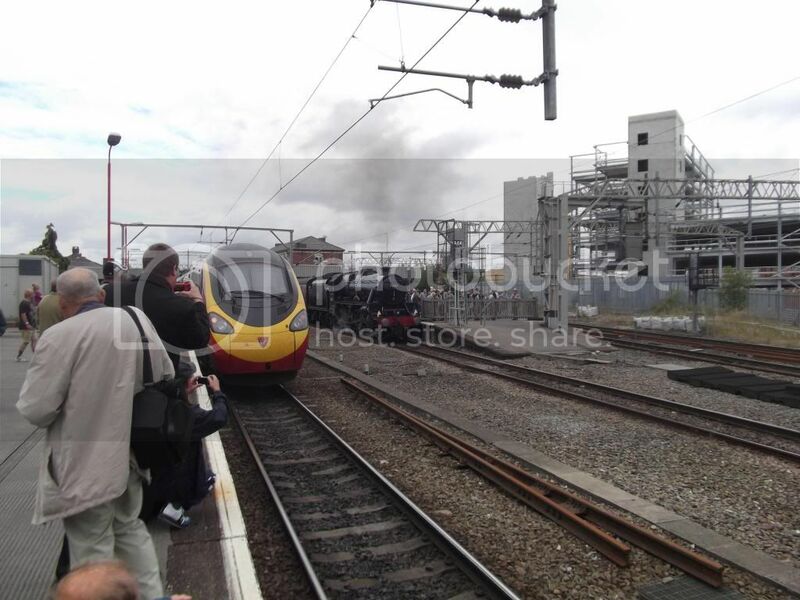 They had been in London and only just made it today as later Virgin Trains from London were cancelled or severely delayed due to a landslip near Milton Keynes. They just made the connection at Stockport and were met and escorted by members Kim and Allan Burrows for the famous "Ghost Train" trip to Stalybridge. We apologise for the lack of photos of these very dedicated visitors. American Stock Car Driver to ride the "Folk Train ! 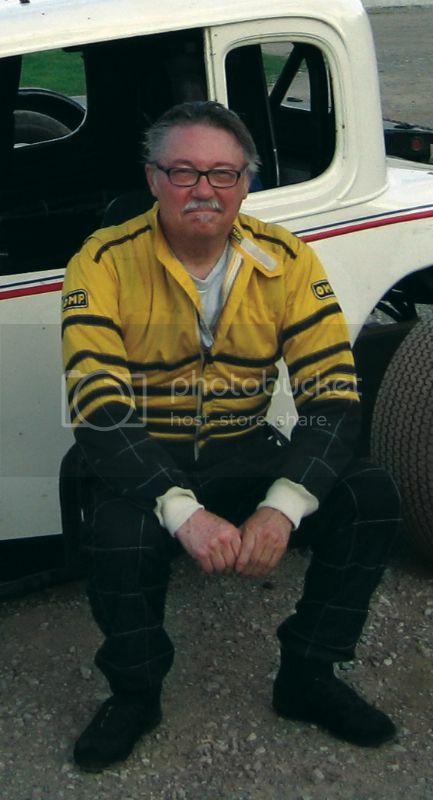 Jamie Pfeifer who has held track championships at Saugus Speedway , Ventura Raceway and Santa Maria Raceway , all in California, who has also represented the USA in World Championship Finals at Belle Vue and Coventry Stadiums in the 80's, will be riding our "Folk Train" on Friday August 26th. Jamie who is in England again to represent the USA in the Heritage class of preserved and replica Stock Cars at Coventry Stadium on Aug 20th. He is also an avid rail enthusiast and saw Dave and Dot on Paul Mertons "Secret Stations" TV programme and decided to fit Reddish South in on his busy schedule. He is looking forward to the folk music and a bacon butty in the famous buffet bar at Stalybridge Station. Jamie (USA 99) will also be appearing in a Heritage Stock Car at the Ormskirk Motorfest on Sun 28th August. He is pictured below next to his Model A Ford Heritage Stock Car at Belle Clair Speedway in Illinois USA. De Trafford Estates based in Alderley Edge have said that they are backing our campaign for passenger services to Manchester as they are now in the process of developing the old derelict Elisabeth Mill on Houldsworth Street Reddish. The old mill and site will be known as Elisabeth Gardens as it is in the St Elisabeths conservation area of Reddish, which also has a beautiful park, the fantastic St Elisabeths Church and St Elisabeths Primary School. The horrible sixties "Friedland" concrete block building will be knocked down with new town houses and gardens built on this site. The old mill will be converted to apartments with the main facade and shell of the building being kept with the new apartments developed inside. 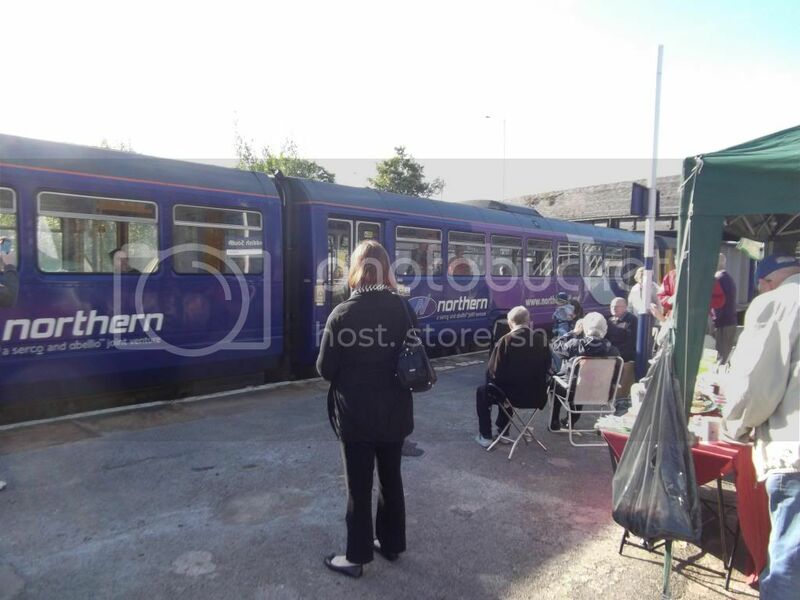 This is a top class build and conversion, and De Trafford Estates have recognised that our campaign will also enhance their advertising as such a passenger service would be a great benefit for their new residents as well as everyone else already living in Reddish, and Denton of course. Please check out the official De Trafford website to see their endorsment of our campaign. July 2016. The "Canterbury Belle" Retro Railtour. Saturday July 9th. A report & photos on this fantastic day out and also the Stockport Station Show, will be on the "Events" & "Pictures" pages shortly . Double clicking on any image will bring it up full page. Use your "back" key to return. Sir Nigel Gresleys World famous 60103 "Flying Scotsman" steamed through Reddish South en-route from the York Railway Museum to the Crewe Heritage Centre this afternoon. Unfortunately Network Rail had closed the Station Platform and banned all enthusiasts and photographers, but of course we still have our "Red Bridge" vantage point where the above photos were taken from. 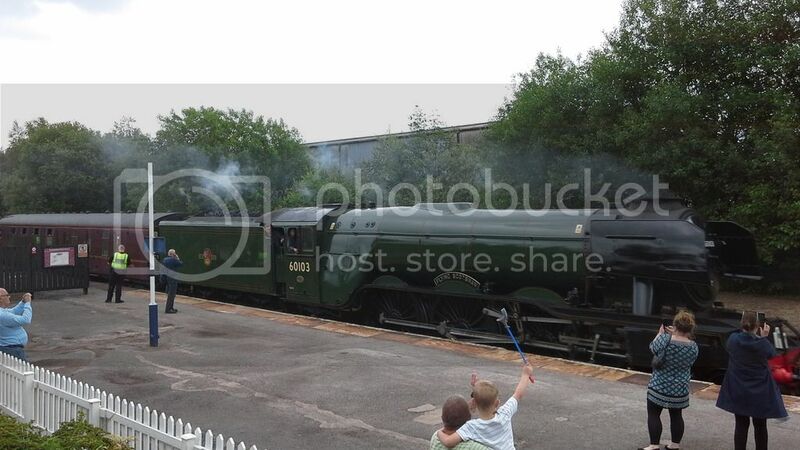 The famous locomotive came through again from York to Crewe today (14th June) and there were 74 people on the Station to see it , plus one enterprising chap who had his own "cherry picker" to get the very best view of all ! Fortunately we had taken a load of flyers with us for the Canterbury Belle railtour and we got absolutely lots of interest in the excursion which hopefully will turn into some firm bookings. May 11th 2016. ACORP Community Rail Event. We had a small promotional display on the Manchester Piccadilly Station concourse today. Unfortunately only 3 "Friends" groups were there and also the promised display tables didn't turn up but a few borrowed chairs from an Italian restaurant did. We still made the best of the time and our good spot on the concourse, and we had a lot of interest about our continued campaign for passenger services along our line. We also gave out lots of application forms for the Retro Railtours excursion train that picks up at Reddish South on July 9th to Clapham Junction London and Canterbury. There is a photo of this event on our "pictures" page. Don't forget this Sundays Paul Merton "Secret Stations" programme on Channel 4 at 8:00pm. This is the railway programme featuring small request stop stations and hopefully will feature Reddish South and Denton Stations that Paul visited and filmed last year. Sunday May 15th 8:00pm. April 28th 2016. Mayor of Stockports Reception. 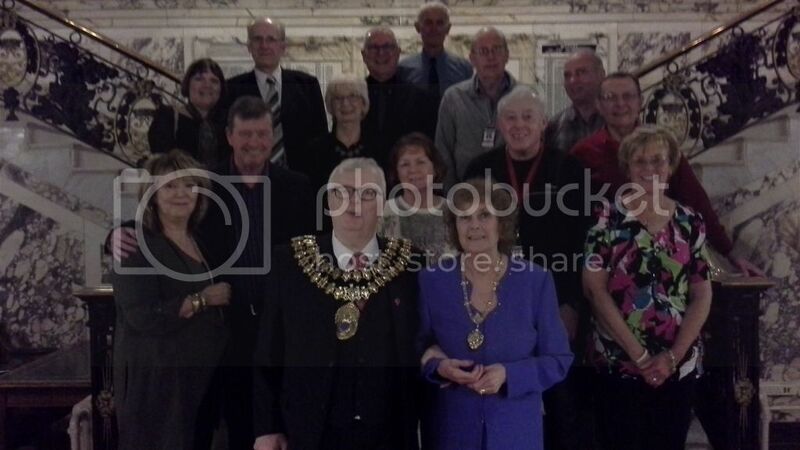 Some of the FoRSS committee were invited last night to the Mayor of Stockport Cllr Andy Verdeille and Mayoress Cleo Cundall's reception in Stockports magnificent Town Hall in appreciation of the continued work being done by FoRSS . The Mayor who is a committed environmentalist thanked us for the efforts in trying to get passengers off our overcrowded roads and onto trains, as of course we are campaigning for such train services along the line between Stockport and Manchester Victoria. In return we thanked the Mayor and Mayoress for their efforts at official Council level along with their work with MP Andrew Gwynne and officers from Tameside Council at high level talks with Arriva North, to actually get these much needed railway services. Without such support we could not have got so much progress with Northern Rail and the new Arriva North. As Mayor Cllr Andy Verdeille is now coming to the end of his year of service as Stockport's Mayor it is also a time to recognise his hard work this year in Stockport and in particular to lots of different projects here in Reddish itself . Many Thanks. 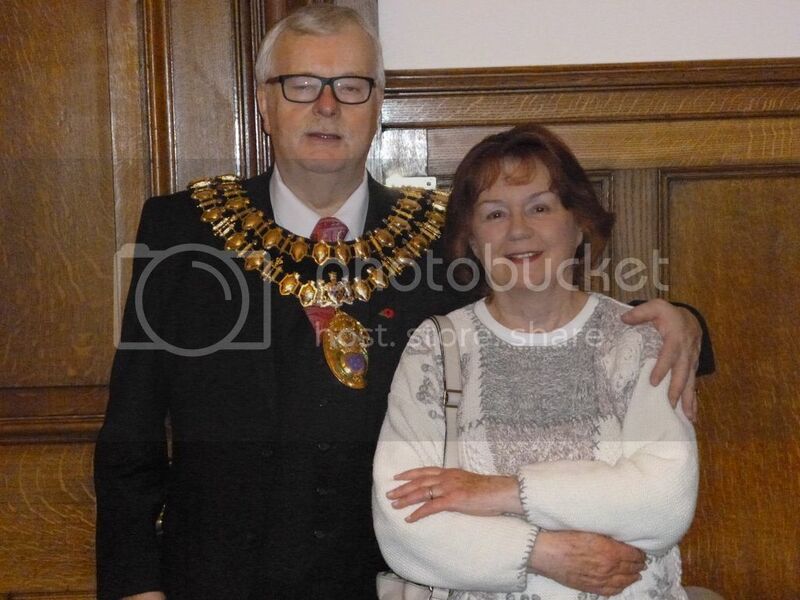 Top left shows our party in Stockport Town Hall and top right retiring Mayor Cllr Andy Verdeille with prospective Labour candidate for the South Reddish ward Mrs Yvonne Guariento, already a keen supporter of our "Friends" group campaign. Double clicking any photo will bring it up full page. Your "back" button will return you to this page. April 24th. The Friends group FoRSS, are now on "Twitter" Please check our FoRSS account for the latest news and gossip. 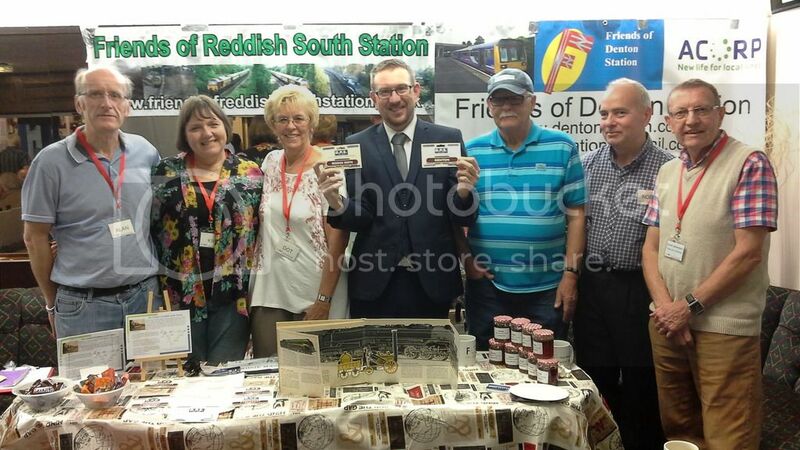 Also we now know that Reddish South and Denton will feature on Paul Mertons "Secret Stations" programme on Sun May 15th which will be the third in a short series of programmes on Channel 4 about stations in Britain that still have request stops for their sparse railway services. April 22nd. No news yet from Arriva regarding our services, but please see the "News" page for this years Retro Railtours tour, stopping at Reddish South. Mon 25th March. 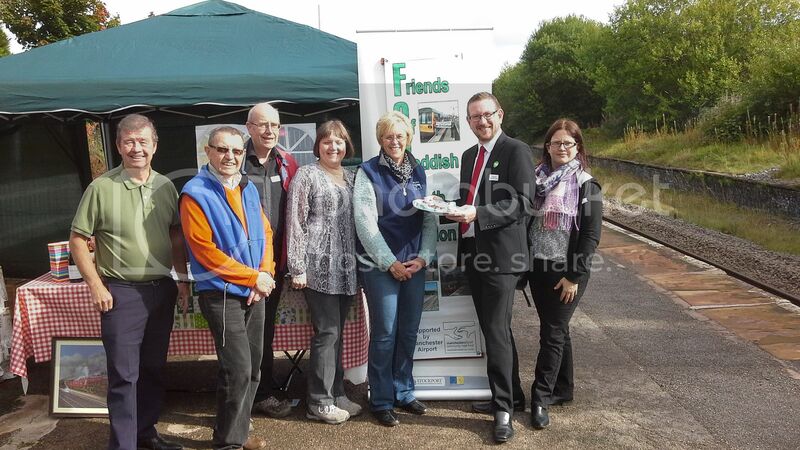 See our "Events" page for the report about our Good Friday "Folk Train"
Despite many more meetings by our officials, Councillors, local MP Andrew Gwynne, with Arriva North and TfGM, there is no news yet about new services along our line through Reddish South and Denton. However we expect some progress soon. 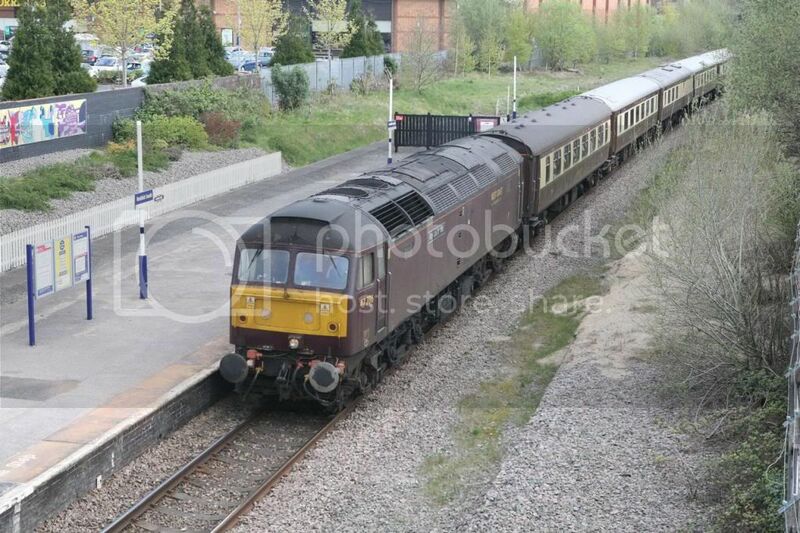 There is news however of a very unusual train which will pass through Reddish South next Sunday March 6th. It will be a "Branch Line Society" special members tour from Manchester Piccadilly to Leeds Neville Hill . The Society specialises in using unusual passenger stock for quite long tours and also for visiting lines, sidings and depots etc not normally used at all for ordinary passenger services. This special tour will be using two class 142 "Pacers" that unusually will feature a catering trolley and mobile bar. It will be visiting such places as Stockport carriage sidings and several passing loops, freight yards and Leeds Neville Hill motive power maintenance depot. Obviously railway tours for serious railway enthusiasts. The train will call briefly at Reddish South for the enthusiasts on board to photograph our unique station, at about 10:15 on March 6th. However you cannot board the tour, being a members only special, and it is oversubscribed anyway ! Monday 21st Dec 2015. Arriva North get the franchise. Arriva North the German owned train operating company have been announced as the new franchise owner taking over from Northern Rail in 2016. Although Arriva Trains Wales have been very heavily criticised for severe overcrowding , late trains and poor catering facilities on long distance trains, Arriva North can only improve the rail services in our area and just maybe include our service requirement in their new franchise. Andrew Gwynne MP and Sir Richard Leese the Greater Manchester Council Leader have been lobbying Arriva North for services along our line and hopefully we may be able to get these services if their high level talks bring success . Watch this space. Fri Sept 25th MacMillan Coffee Morning. 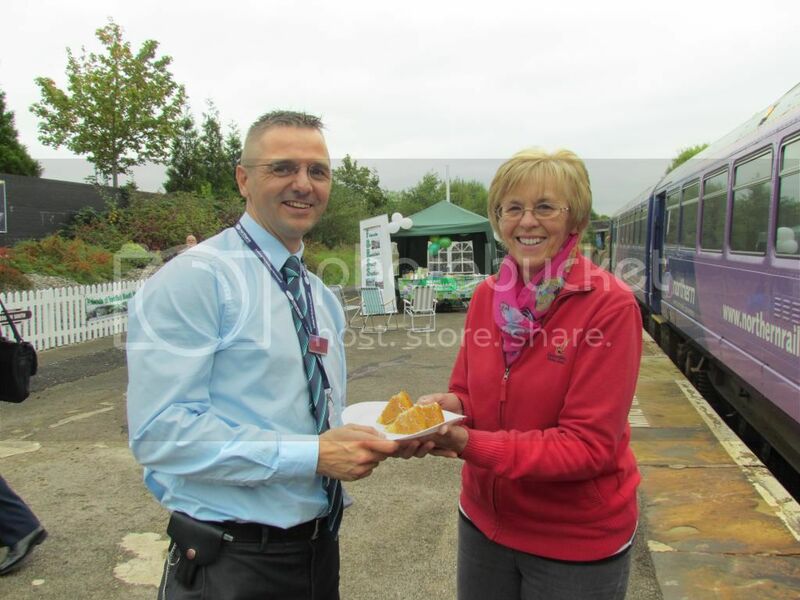 We had a brilliant morning down on the Station platform when we held our annual MacMillan charity coffee morning. There were just too many people who gave their time , cakes, buns and money for this worthy cause to mention in any detail, so its just best to say that we made £260:00 , which was made up with about £243:00 on the day plus an additional £17:00 made by Cllr Tom Grundy selling off the very last few cakes at a special meeting of Stockport Councillors later that day. It was superb to see the vast array of cakes and buns on offer and also great to see so many visitors coming down to eat them ! We even had one lovely lady who could not manage the steep steps down to the platform , but she stood at the top of the steps waving a £5 note for the Charity. We offerred her a chair and a cup of coffee and a cake but she just wanted to donate her gift ! Brilliant. Fortunately one of the ladies persuaded her to take some Bara Brith fruit cake and that lady's lovely contribution to the cause was typical of all our visitors and fundraisers to get to that vast total in just 2hrs. Many Thanks to everyone who came or contributed, and special thanks must go to our very special guests Andrew Gwynne MP for Denton & Reddish and his wife Allison who took time out from his very busy schedule to support us. Infact , the following day he had to dash all the way down to Brighton for the Labour Party Conference. 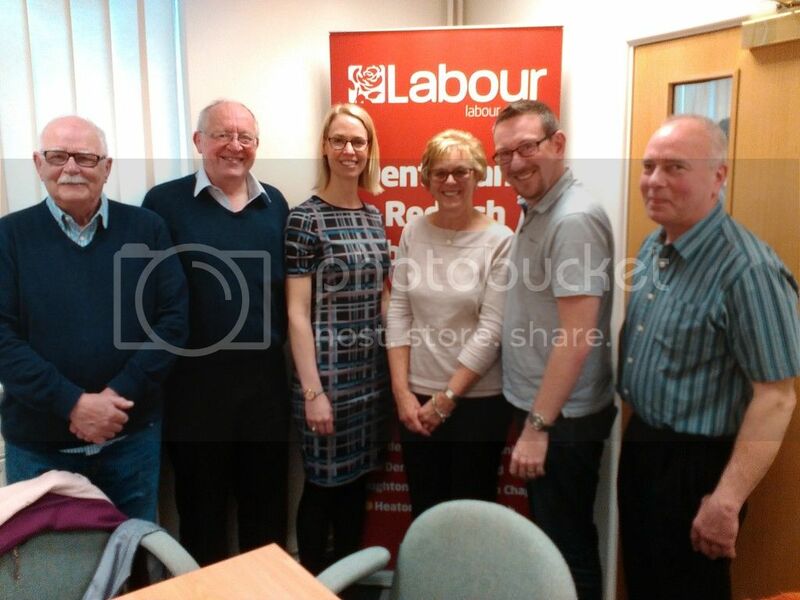 Pictured on the left above are Andrew Gwynne MP , Allison Gwynne with our local Councillors Walter Brett, Tom Grundy and FORSS members Kim Dave and Dot. 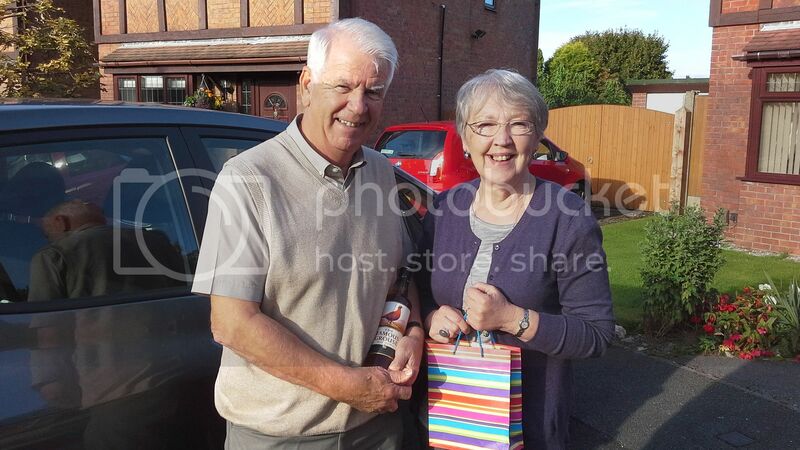 On the right are two of our raffle prize winners Jean and Jeff Howe of Heaton Chapel who won a box of chocolates and a bottle of whiskey ! Fri Sept 11th. TV Presenter & Comedian Paul Merton visits Reddish South ! ! 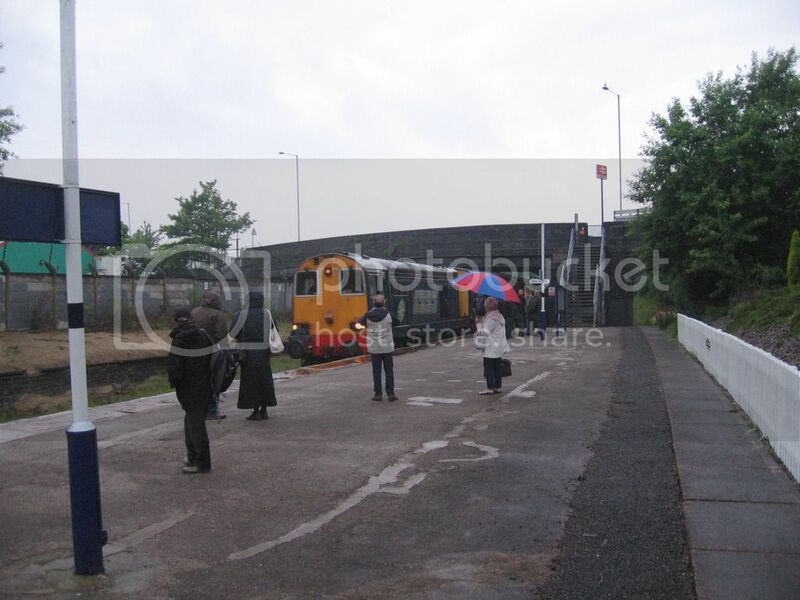 More photos of the filming at Reddish South will appear here next week. Double clicking any image will bring it up full page. Use your "back" button to return to this page. 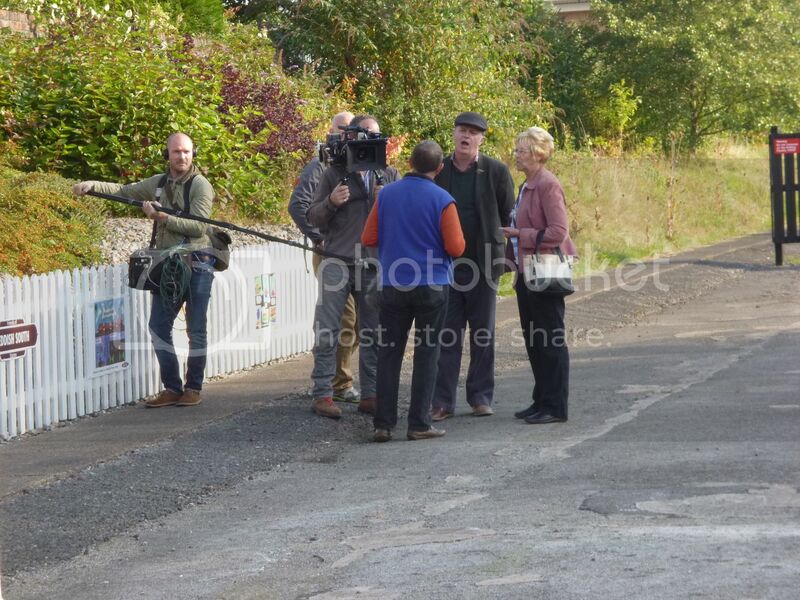 The photos above show Paul and some of the Brown Bob Productions crew chatting to Dave and Dot Ashworth at Reddish South Station. 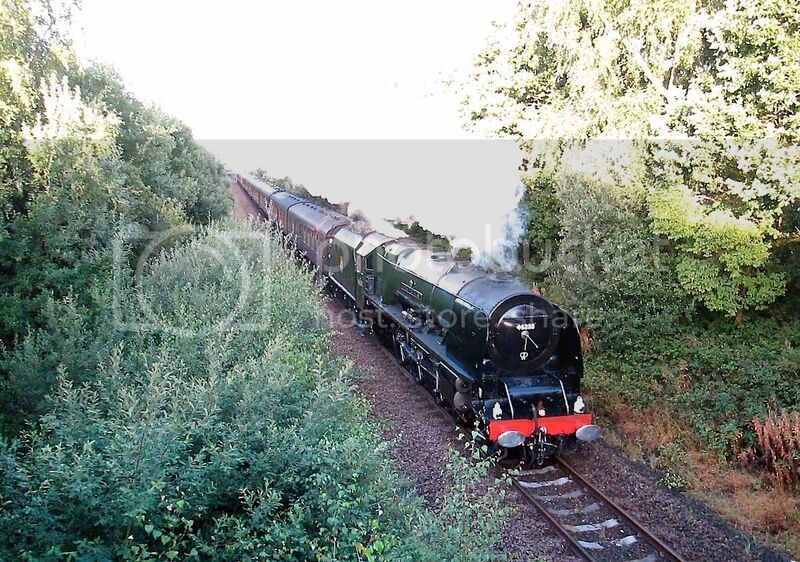 Sat Aug 15th Crewe to Carlisle steam excursion. 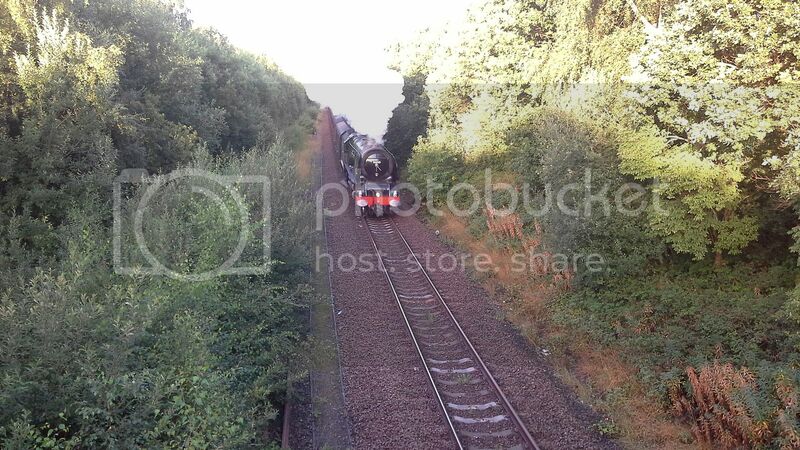 This steam hauled special came through Reddish South this morning on its way to Carlisle. It will be returning this evening and will be taking on water at Denton Station, as the steam locomotives usually do when using our line. The loco is a Princess Coronation 8P Class 46233 "Duchess of Sutherland" which has been through Reddish South many times in the past. Thanks to Keith Chapman for photos . Double clicking any image will bring it up full page. Use your back button to return to the web page. Aug 16th Stockport Station Railshow. 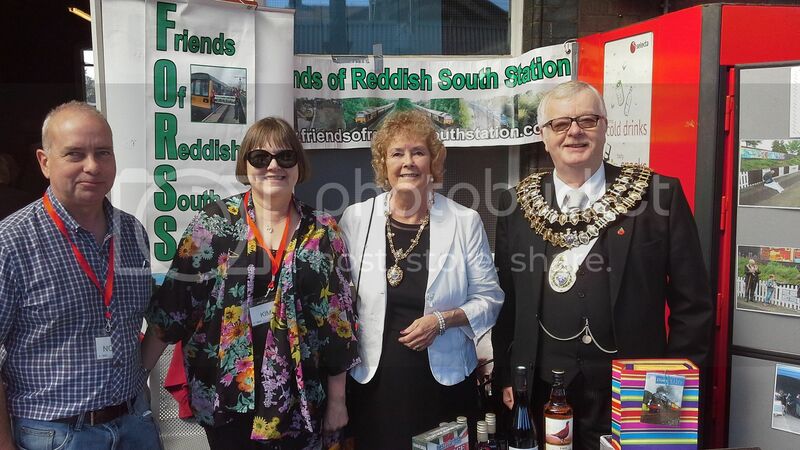 We attended our 3rd Stockport Station Railshow and had one of our best days there with scores of visitors to our popular stall including Stockport Mayor Cllr Andy Verdeille and Mayoress Mrs Cleo Cundall. We also hosted Stockport Councillors Walter Brett and Tom Grundy and visitors from as far as Stone Staffordshire, Chorley and Prestwich. The show was a great success and there were many stalls including East Lancashire Railway, Mid Cheshire Rail Users Association, Cheadle Hulme Model Railway Society and a superb Art Stall by Leanne Thompson with her fabulous and imaginative modern railway art, featuring some images of Virgin Trains. There were far too many other stalls to mention. We raised £56 in our raffle, donating £30 to Virgin Trains Charity " When you wish upon a Star" The Luke Foundation. A great day out, and we look forward to next years show. Also of course we raised lots of interest , enquiries and new members to our campaign for passenger services from Stockport (and beyond) to Manchester Victoria (and beyond), along our line through Reddish South and Denton Stations, which is now in the hands of The Government and its forthcoming decision in awarding the new franchise for our area. It was such a shame that the annual "Reddfest Community Event" and the "Retro Railtours" excursion to Skegness fell on exactly the same day after months of completely separate planning by both sets of organisers ! This meant that most of us at FORSS and most of the railway enthusiasts we have spoken to on our weekly "Ghost Train" trips had to choose and it meant a very much lower number of people went on the "Retro" trip to Skegness from Reddish South Station. The photos above show both events on Sat 13th June, and many more photos will appear shortly on the "Pictures" page. Dot Ashworth the FORSS Treasurer was interviewed today on the Station platform by Tom Airey who does contract work for BBC Radio Manchester. Tom writes for the BBC's website and was doing research about the Norths' "Parliamentary" or Ghost Trains as we know them. He came to the station to see our famous Ghost Train for its once a week journey to Stalybridge, and to learn more about it. However Dot and members Alan Burrows and Dave Ashworth also bent his ear about our ongoing campaign for a proper passenger service to Manchester Victoria, and Tom was really impressed with all our work at the station, the garden, the mural and the latest art competition and project that will be unveilled and completed on Saturday June 13th. He already knew a bit about "Ghost Trains" but knew very little about our campaign and was really very interested in it. It may well be that if our local ghost train gets some publicity on the BBC website, our campaign will get plenty of publicity too. Well done to Dot for a great interview and thanks to Alan and Dave for back up support too. 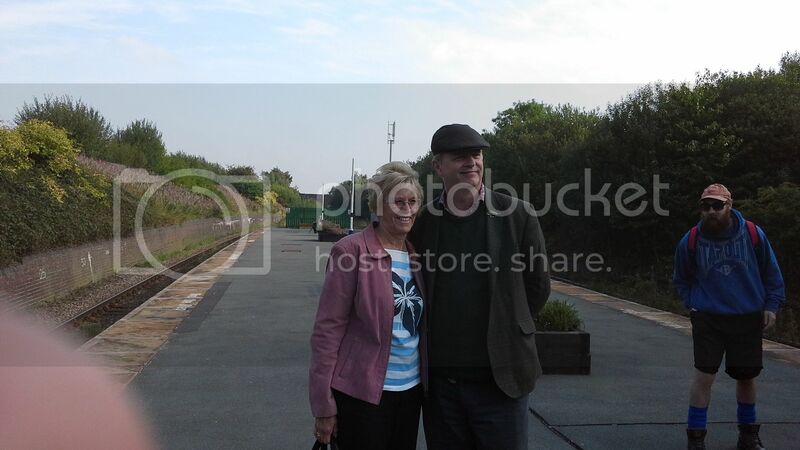 The photo below shows Dot and Tom at the station today. Double clicking the photo will enlarge it. Your back button will return you to the page. May 8th 2015. Art project Judgement Day ! 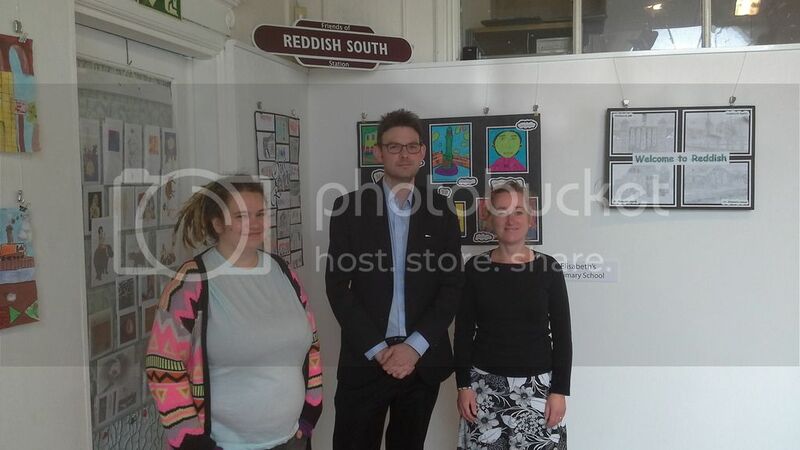 Today saw the judging of the superb paintings and drawings by five local schools in the theme of "Welcome to Reddish" . The best of these will be professionaly made into posters and will be displayed on the Station Platform picket fence, and in our poster case at the Station. The posters have been displayed in the ARC gallery on Greg Street Reddish and were judged today by Artist Lucie Fitzpatrick, Stakeholder Manager for Northern Rail Matthew Woolmer and ARC Artistic Director Jacqui Wood. All three of the Judges were impressed with all the work done by the children from each of the schools and all stated that the posters had really caught the theme of Welcome to Reddish very well. The winners will be announced on the Station by MP for Denton and Reddish Andrew Gwynne, as he unveils the larger scale professionally made permanent posters on the Station on Saturday June 13th. More details are on the "News" page. April 27th. See our "News" page to read about our brilliant art project ! April 3rd Good Friday. 2015. A report on todays excellent "Folk Train" is now on our EVENTS page. Please see our "News" page for information of our new Community Art Project ! Some great news of progress with our campaign for passenger services from Stockport to Manchester Victoria via Reddish South and Denton materialised recently with our committee officials having or being invited to meetings with some of the rail companies bidding for the new franchise that will replace the present Northern Rail francise in 2016. Already two meetings have been held with Arriva Trains and more are planned with them in January, also meetings are being arranged by Railfuture with Govia and Abelio two more franchise bidders. Obviously we cannot say too much about these crucial and delicate meetings but FORSS are confident and excited that these companies have seen and are listening to our campaign and that all of them are forward looking railway companies who are interested in enhancing local passenger services and are also committed to phasing out the dreaded two coach Pacers . Exciting times ahead ! News also comes this month with 3 mentions in the influential "Rail" magazine although yet again the passenger figures quoted are way out ! Basically they announce that Reddish South is the 3rd quietist railway station on the National Network with just 26 passengers this year. Obviously with two packed "Folk Trains" and two full length excursion trains to Edinburgh and Stratford upon Avon, the grand total should have been well over 200 and also this does not include the many times we have been ourselves to Denton on the once a week 09:26 train when the conductor does not bother to check tickets or collect fares. Ironically just the once out of many such short trips to Denton have I been challenged for a ticket and was told in a very strong and bombastic way that my pass was not valid as it was before the dreaded 09:30 deadline. This was despite the train being 6 minutes late arriving at 09:32 ! I had to pay the Senior Railcard fare of £1:90 for this 5 minute trip so I became one of the "Official" 26 passengers this year. December 7th. 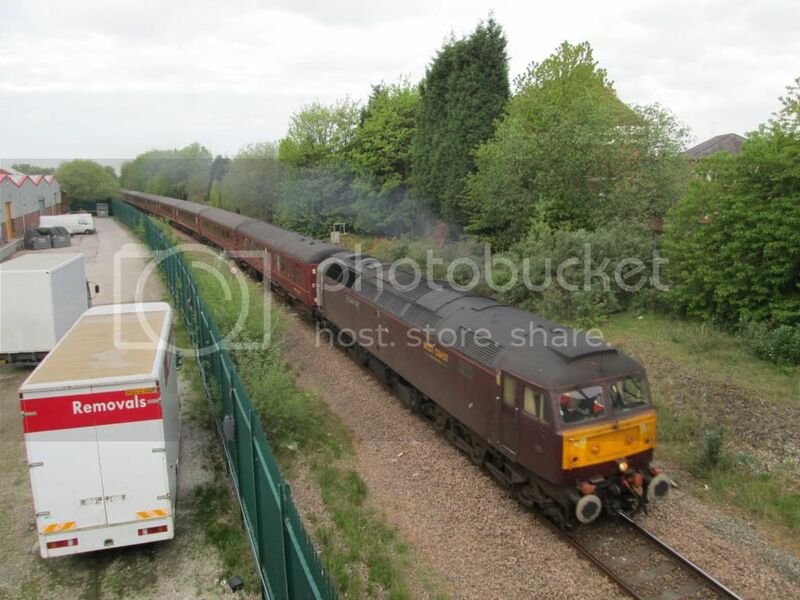 Brand new loco visits Reddish South ! 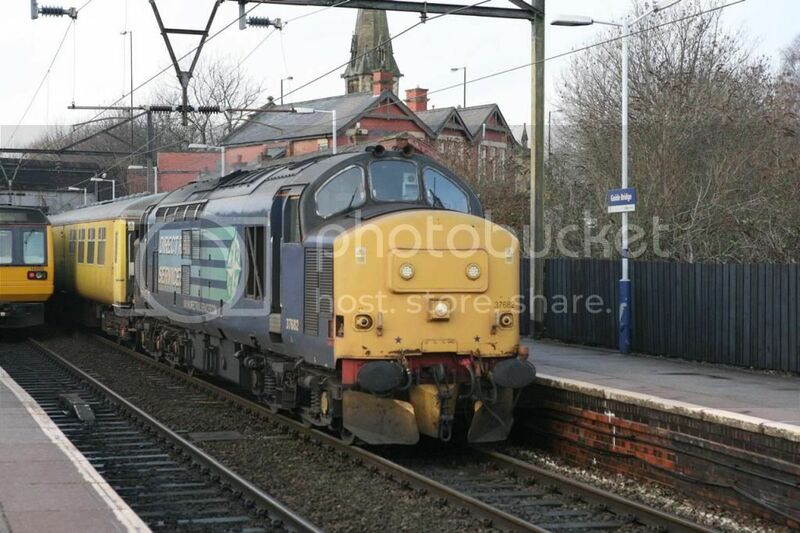 This brand new "Direct Rail Services" Class 68 came through Reddish South on the "Yorkshire Yuletide Express" from Newport (South Wales) to Leeds this week. This "scoop" was captured for us by member Keith Chapman . By the way expert photographer Keith Chapman has now had some of his photos published on two renowned & top quality railway websites www.railtalkmagazine.co.uk and www.railpictures.net/showphotos.php?userid=19055. Apologies that you cannot get a direct link to these sites off ours, but of course you can "copy and paste" these onto your browser to find them. Nov 2nd 2014. 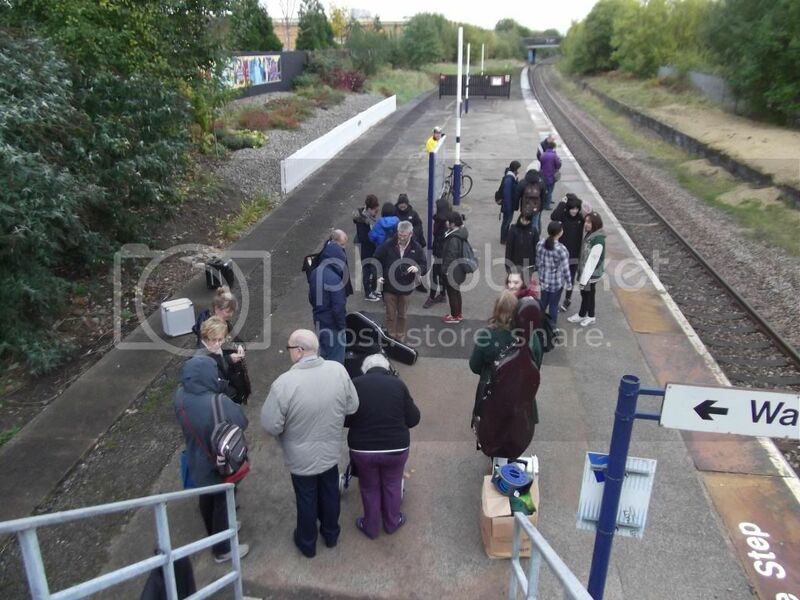 See the "Events" page for a report of last Fridays "Halloween Folk Train"
Friday morning Reddish South Station Platform. 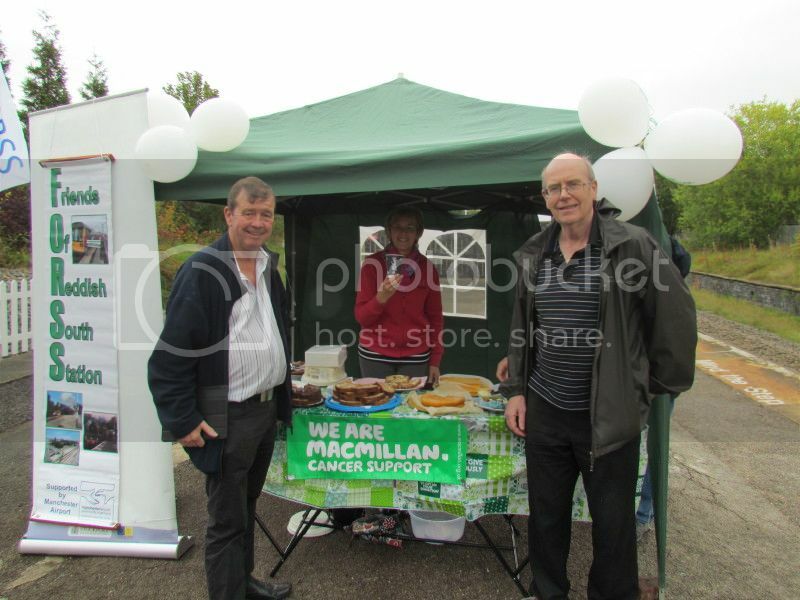 Despite pretty constant drizzle and later heavy rain, and despite other very local Macmillan coffee mornings, and even despite our local supermarkets refusal to even announce our event down on the platform next to their car park, we still attracted a lot of local support and have so far raised £196 in cash. There will be more donations to come when"Ace" fundraiser Terry Rourke adds up the money from his brilliant quizzes, find the jack, and name the station fundraisers ! We will of course bring the total ammounts here on this page when everything is added up later. 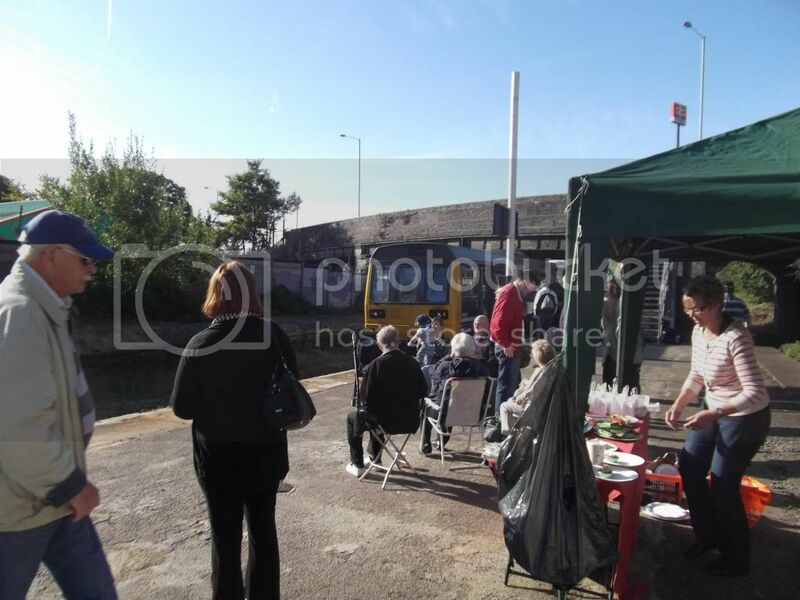 The "Friends of Reddish South Station" would like to thank all those who came to support this noble charity and those who baked cakes, made the tea/coffee, gave prizes, put up flags, etc, etc. It was all fantastic ! 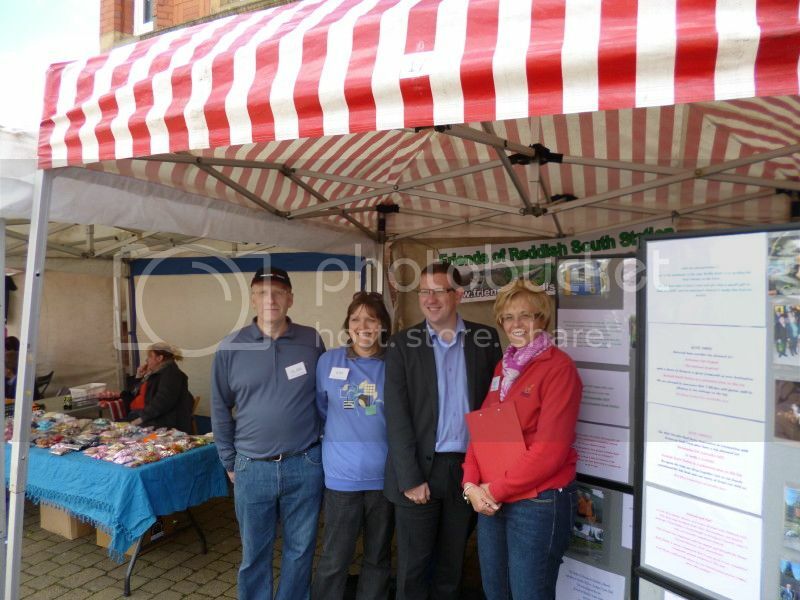 The photos above show (top left to right) Cllr Walter Brett , Treasurer Dot Ashworth & Cllr Tom Grundy. The 09:26 "Ghost Train" Guard enjoying some cake before departure, and bottom L to R. Dot Ashworth with fundraiser extraordinary Terry Rourke, and member Dave Ashworth pledging £10 to go "Sober for October" for Macmillan. This will be particularly difficult as he loves a very large brandy on Sunday evenings ! Anyway he also promised to double this if he fails. More pictures of the event will be published next week on our "pictures page"
Sunday Sept 28th. Superb news today ! ! Terry Rourke announced today that he had raised £300 from all his various fund raising efforts which gave a grand total of £496, but the "Friends" group FORSS donated the extra money to top the total up to £500 exactly. This amount will all go to the fantastic Macmillan Cancer Support Charity. Latest Great News ! ! Below is part of a very important letter received from "The Greater Manchester Chamber of Commerce" that shows their interest and desires for for the passenger service we are campaigning for. This was just a part of a 3 page letter sent to The Department of Transport in London and this gives us a tremendous boost at this crucial time of the current consultation process of the renewal/replacement of the Northern Rail franchise. 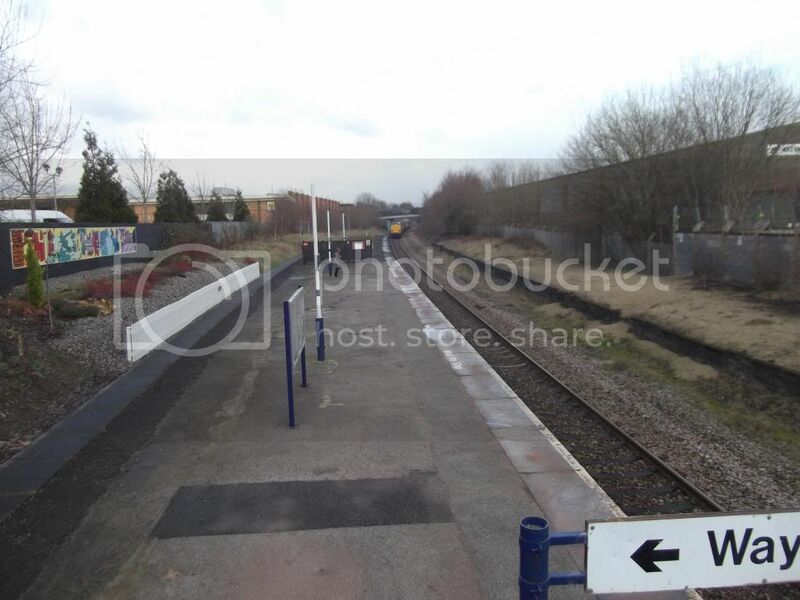 •" There are also aspirations from local businesses in Stockport and Tameside for a new service from Stockport to Manchester Victoria via Denton and Reddish South stations. Whilst Denton and Reddish are currently lightly used, there is considerable investment being attracted to the eastern side of the city, creating jobs that need to be accessed so we would be keen to see if a business case could be built whilst the largest scale re-mapping of services in living memory is underway. The main issues discussed form a significant part of our Business Manifesto produced in advance of the General Election 2015. I hope that you will find our comments useful and would be happy to discuss them further." * The letter above was re-printed with the kind permission of The Greater Manchester Chamber of Commerce whose support we appreciate. Mon Aug 25th Retro Railtours "Stratford on Avon" tour. 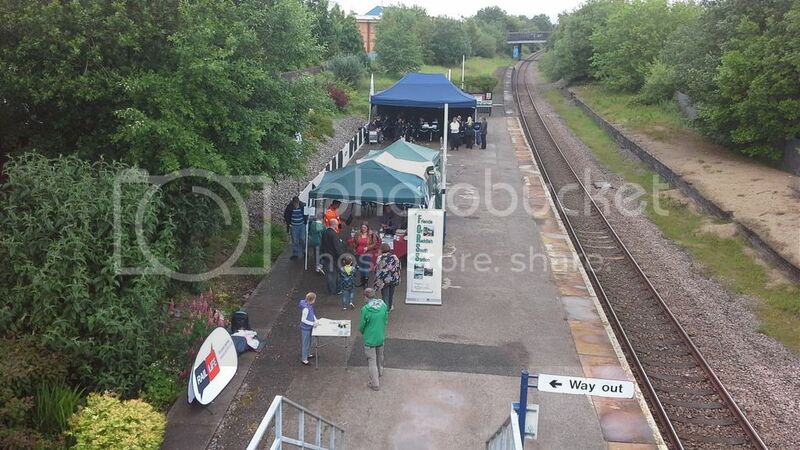 Sun Aug 10th "Stockport Station Railshow !" See the "Events" page for a report of the Railshow. Sun 20th July. 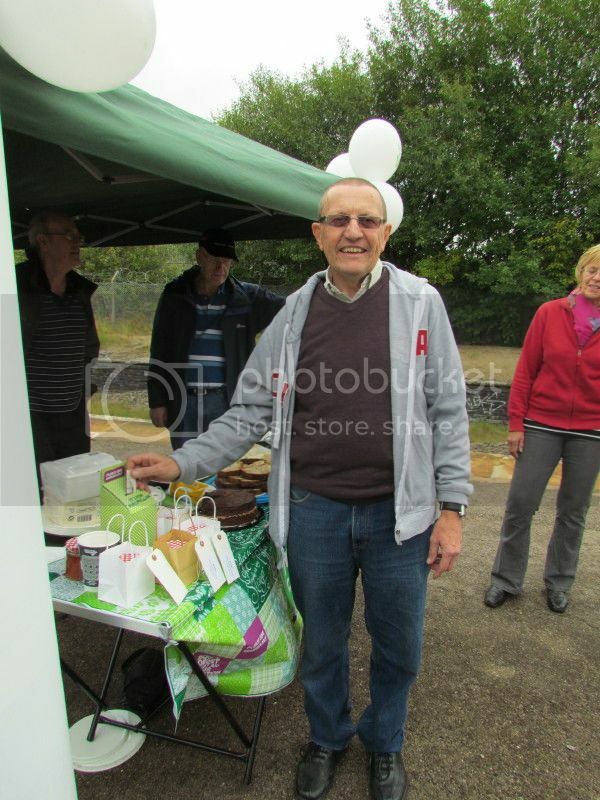 Todays Reddish Vale Fun Day report & pictures, can now be found on the "Pictures" page. Sat June 28th saw the Retro Railtour from Reddish South Station to Edinburgh for a 4hr visit to Scotlands Capital. A full report of this rare mileage and rare traction railtour can be found on our "Events" page, also see our "News" page for the NEXT tour ! May 7th Yet another railtour ! May 2nd. MCRUA. Railtour to Ayr passes through ! 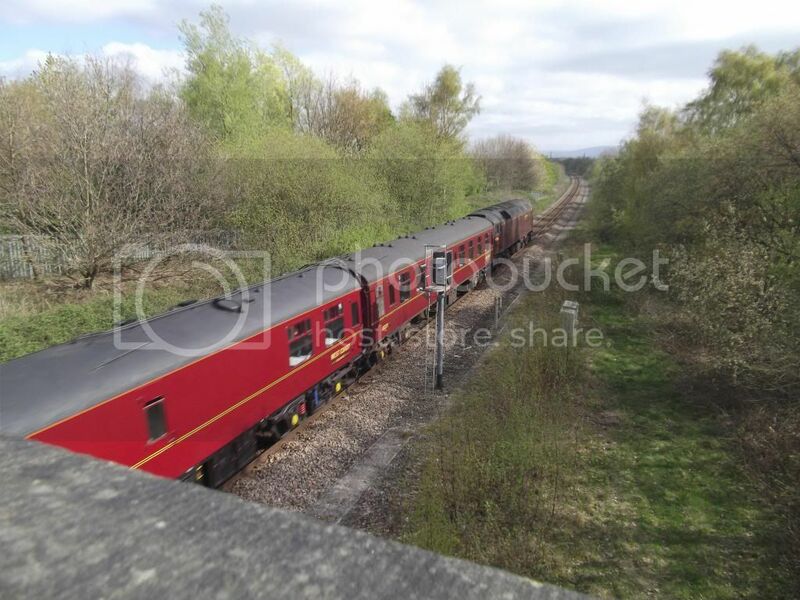 Fri May 2nd saw the MCRUA (Mid Cheshire Rail Users Association) railtour to Ayr Scotland pass through Reddish South without picking up this year. However, several of our members were there to wave the train through on its way to Scotland. The train was hauled by two West Coast Railways Class 47 locos in top & tail mode. However you will be able to join a railtour to Scotland next month directly from REDDISH SOUTH when Retrorailtours "Edinburgh Scot" picks up on Sat June 28th ! ! Please see the "Events" page for full details of how to book on this railtour . 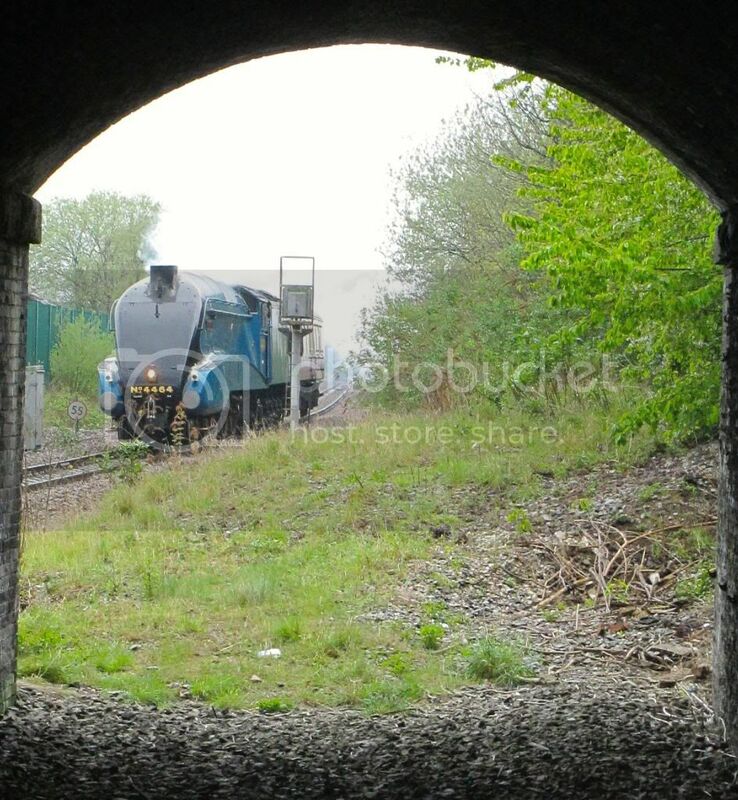 April 19th Statesman Railtour passes through ! One of the first "Statesman" railtours of the season passed through Reddish South on Sat Apr 19th on a first class railtour from Bridlington to Holyhead on a lovely spring morning. It was hauled by two West Coast Railways preserved class 47 locos in a push-pull mode. (47786 & 47826). Photos supplied by our resident ace photographer Godfrey Stafford. 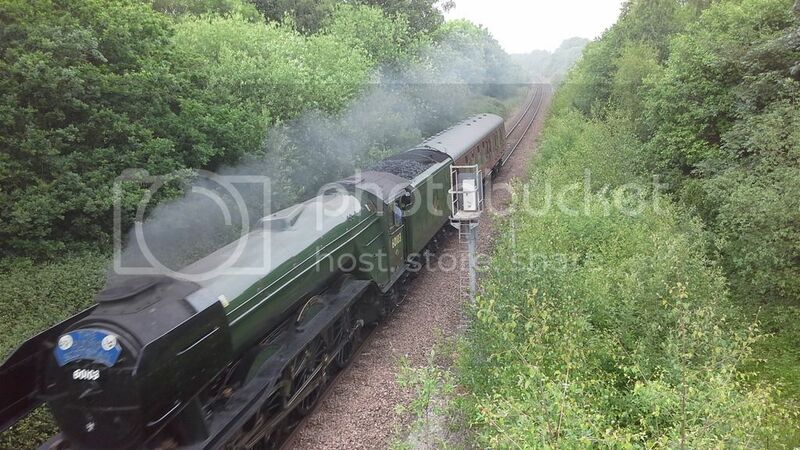 Please see our "Events" page for a report on yesterdays fantastic " Folk Train"
Steam locomotive through Reddish South ! April 9th 2014. Railtour to Edinburgh announced. Please see our "Events" page for full details of this Railtour which will Pick-up and Drop off at REDDISH SOUTH on Sat 28th June. It will be going to EDINBURGH. Mar 18th 2014. News Update & "Events" News. There is very little news from the MBC Executive Councillors & our MP Andrew Gwynne's meetings with the TfGM, but we are assured that they are "ongoing" and that we are at last recognised by the TfGM as being a viable group with genuine needs and aspirations about a regular passenger service along our line between Stockport & Manchester Victoria ( and beyond). We will of course be attending more full MBC Council meetings to get news as and when it comes from our Executive Councillors, and any news will be published here. We can announce 3 important forthcoming events ( A Work Day , Folk Train , and Quiz Night ) and of course these can be seen in full detail on the "EVENTS" page ! Jan 29th 2014. 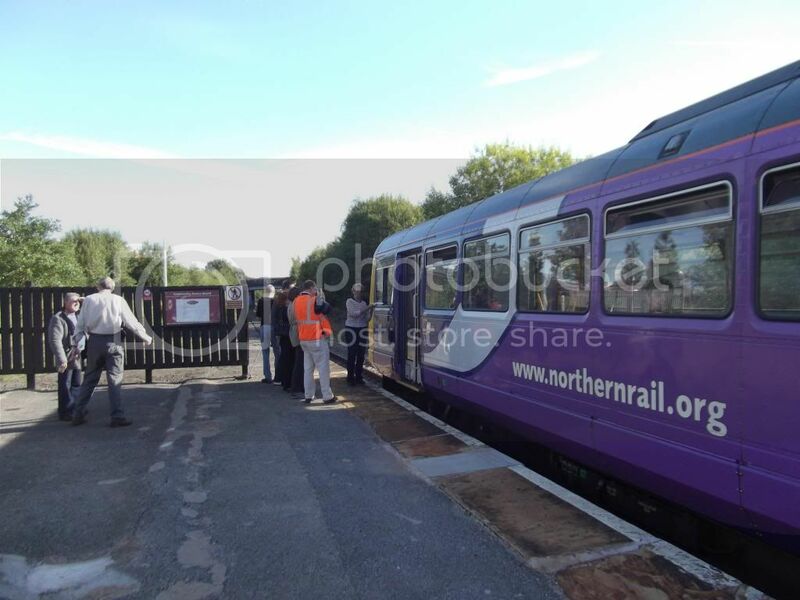 Test train visits Reddish South again. Following extensive work on the track between the "Red Bridge" & the "Money Box Bridge" near Reddish South Station, that disturbed some residents during the very early hours of Tuesday morning this week, the Network Rail test train again passed through Reddish South several times on Wed 29th Jan. 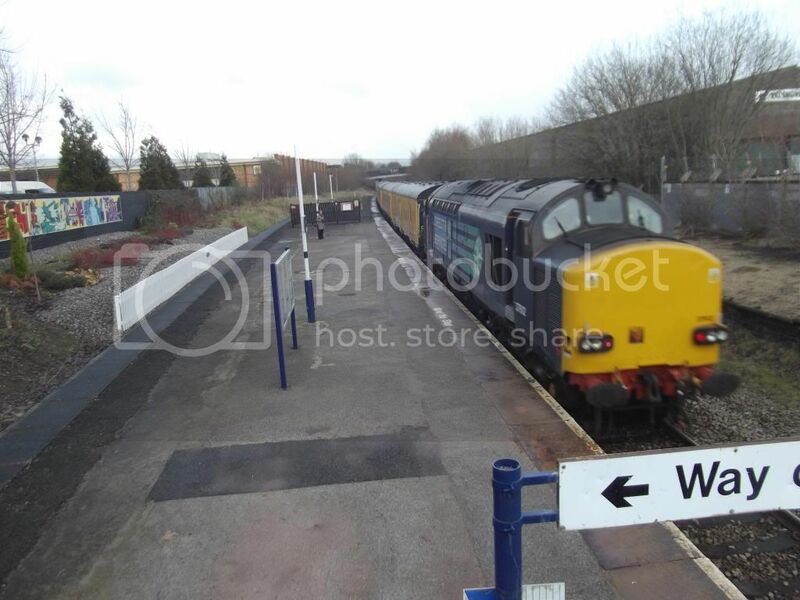 The train , made up of 4 special testing equipment coaches and topped and tailed by 2 Direct Rail Services class 37 locos was caught on camera (below) at our Station at lunchtime that day. A full transcript of the Stockport MBC Executive Councillors reply to the question by the FORSS Secretary, at the Council meeting on Thurs 23rd Jan, asking what progress has been made with the TfGM will be found very shortly on our "News" page. However, we can briefly confirm that full Executive level meetings between Stockport MBC & Tameside MBC with the full committee of the Transport for Greater Manchester (TfGM) will take place, within the next few weeks. Please watch the "News" page for full details shortly. Jan 29th. 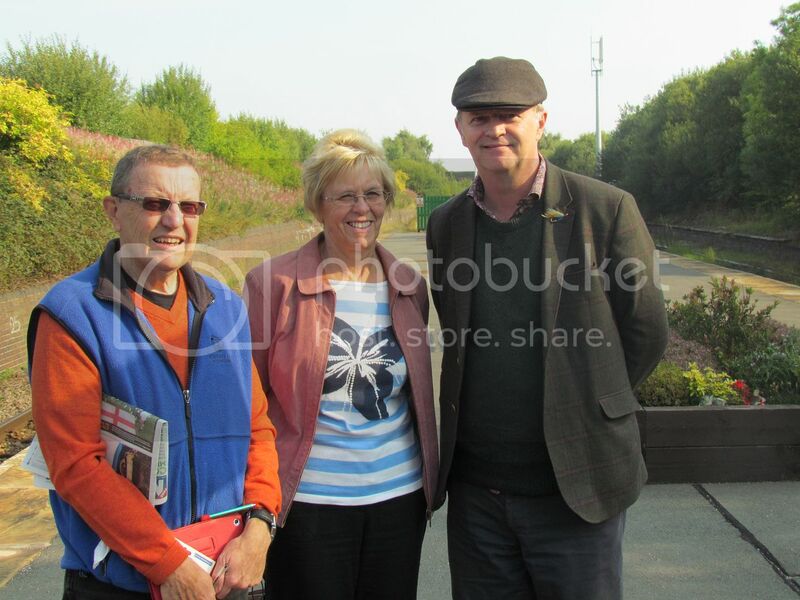 Bishop joins "Friends of Reddish South Station" ! ! We are pleased and honoured to announce that His Grace The Roman Catholic Bishop of Portsmouth Philip Egan has now joined our campaign for passenger services to and from Manchester Victoria. Apparently Bishop Egan, a very keen and enthusiastic railway supporter was given the subscription as a Christmas present. So as well as professional railway men and women, a nuclear scientist and several Councillors, we now have a Bishop on our side ! 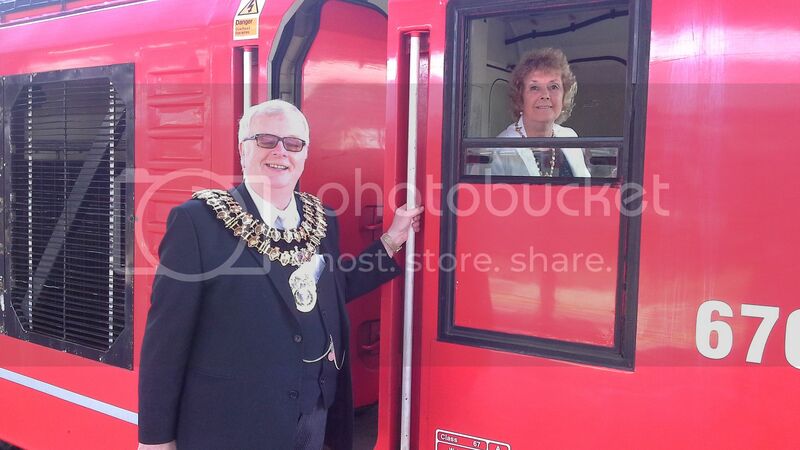 We welcome you Bishop Egan and hope that within a year or two we might be inviting you on our first regular TfGM backed service to Victoria operated by the new franchise holder whoever that might be. Jan 15th 2014. First "Special" of the year. 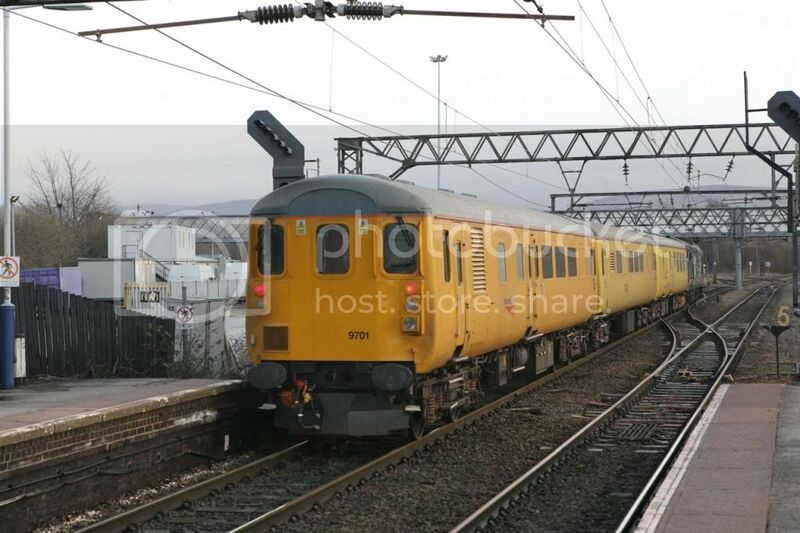 This Direct Rail Services Class 37and 3 coach Network Rail track and signalling test train passed through Reddish South this morning on a convoluted and circuitous route to and from Longsight MPD. 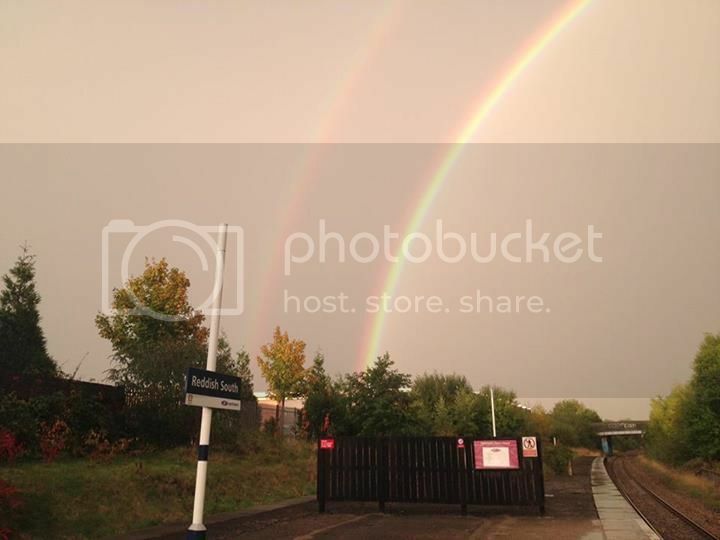 These excellent photos were taken by top railway photographer Godfrey Stafford at Guide Bridge Station , shortly after passing through Reddish South and Denton. Nov 14th 2013. Royal Train at Reddish South ! 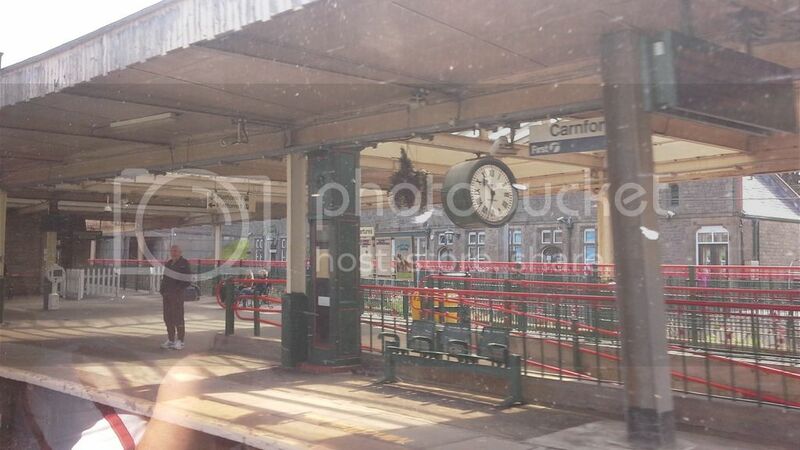 Thursday Nov 14th saw the Royal Train pass through Reddish South Station going towards Stockport. Its route and timings are always a state secret, but it may well have dropped off Her Majesty the Queen at Manchester Victoria for her visit to the new Co-op building and Harpurhey today. It was hauled "top and tail" by two silver DB class 67 locos and consisted of about 5 or 6 coaches, and passed through just after 11:00am. Nov 1st 2013. Folk Train. Some of the early arrivals for this mornings great "Folk Tain" gather on the platform and on the right are our resident Folk Group who went down really well on an absolutely packed train and in the famous Stalybridge Station buffet bar. 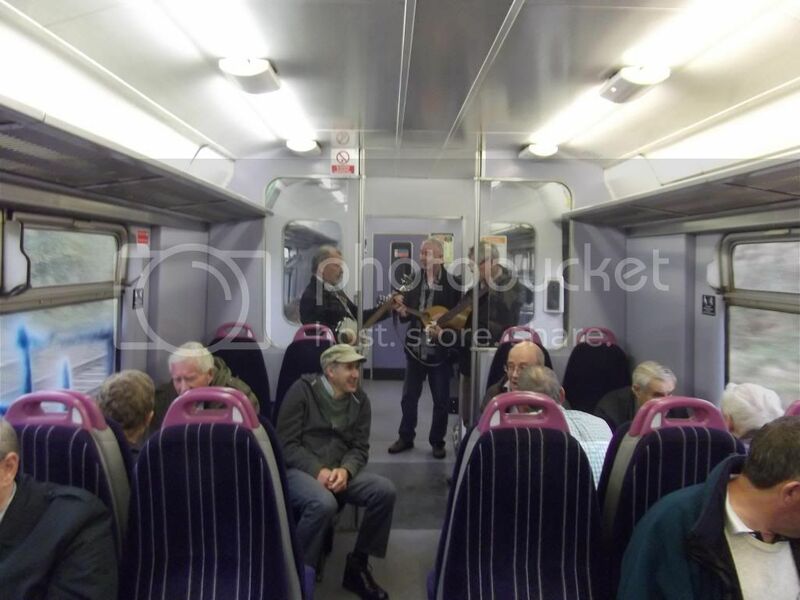 More pictures and a report can be found on our "Events " page but obviously you can see that the Mayors of Tameside & Stockport agree that both communities need a passenger service along the line to Manchester Victoria and not just our "Joke" Folk Train to Stalybridge. ! Council backing ! 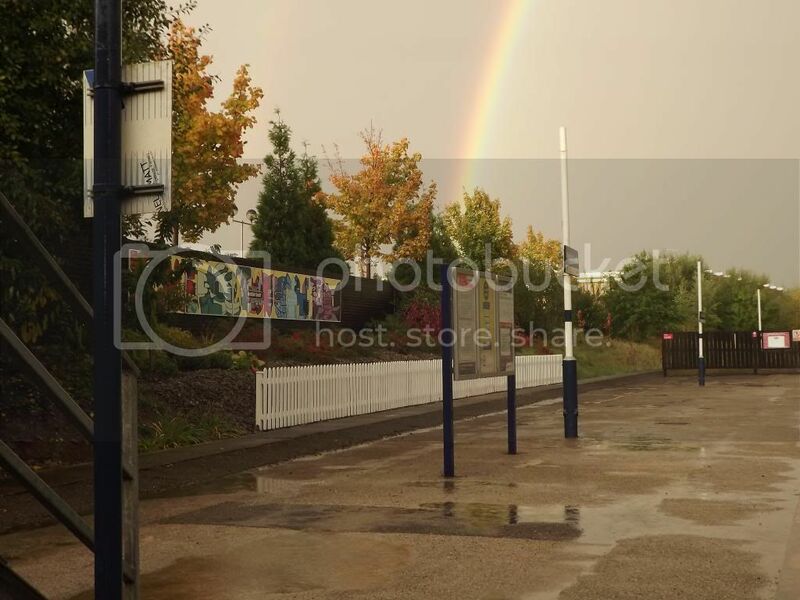 Thurs 17th Oct 2013. It can now be announced that BOTH Stockport MBC and Tameside MBC have now voted unanimously in favour of backing our joint campaign for passenger services along our line. The motion passed in the Town Hall Stockport on Thurs 17th Oct stated "That the service would improve access to attractions , amenities and places of work in the area of the City Centre served by the station for which there is a high demand locally and would have significant economic benefits for Stockport including supporting local employment and visitor attractions." It was actually seconded by no less than THREE Councillors of ALL political parties and was of course passed unanimously. This great news from Stockport MBC was backed by the same support from Tameside MBC earlier in the week and is superb news for our campaign. It means that the councils can now put forward proper professional and ACCURATE financial plans backed by survey results and "Green" issue benefit reports to TfGM who so far have either ignored or produced inaccurate facts and figures against such a service. As MP Andrew Gwynne pointed out, it seems that TfGM have not got accurate information and probably not even seen or read any of our previous correspondance, information DVD's or paper reports. We will be reporting more of our MP's latest information and reports here later, especially those from TfGM representitives to whom he has written forcefully expressing his comments against some of the more inaccurate information coming out of TfGM at the moment. We must all continue to emphasis to TfGM our urgent need for another form of public transport to help people to get to and from Manchester Victoria and beyond, that will alleviate the chronic road traffic situation that blights us all in Reddish and Denton. And remember that such a service would also help people from places like Bolton and Wigan to get to places like Stockport, Hazel Grove or Buxton as well as us all here in Reddish and Denton. First the "GOOD News" then the even "BETTER News" ! ! First of all , the good news , it was a lovely warm sunny day. Then there was a huge turnout including our special guests, the area MEP Chris Davies & his PA Jackie Wilson, our local MP Andrew Gwynne & Cllr Alison Gwynne, and of course the Mayor and Mayoress of Stockport Cllr Chris Murphy and Mrs Murphy. It was also very pleasing to see many senior citizens who managed our steep station steps to support a very worthy charity. At the other end of the age group we also had some young families with babies and even a couple of cyclists who all managed the steep steps too ! ! A GREAT effort and well done to you all and a big THANK YOU ! Some of you may be in one of the photos below. 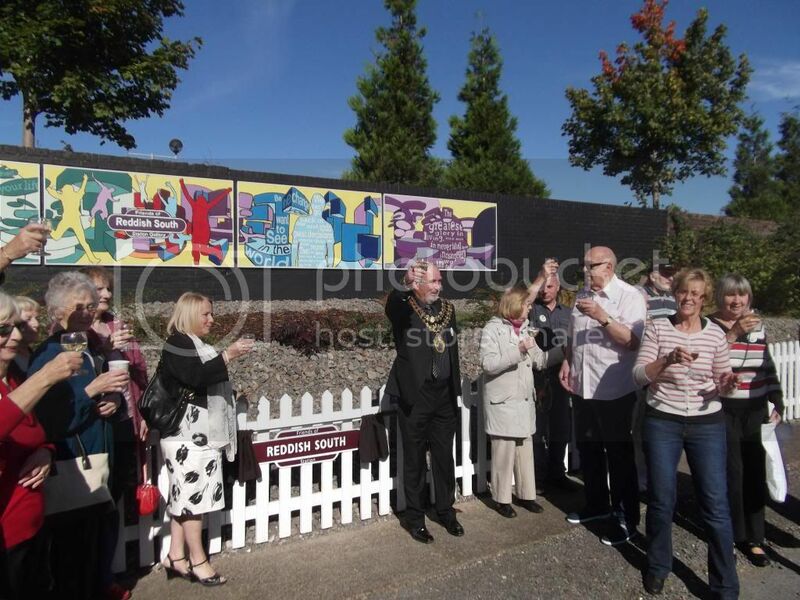 The Mayor and Mayoress of Stockport Cllr Chris Murphy and Mrs Dorothy Murphy raise a glass with some of the many spectators and supporters of the Macmillan event as he unveilled the plaque commemorating the latest landscaping project at Reddish South Station. The above photos show the once a week service to Stalybridge that actually brought a few supporters from Stockport to our coffee morning event including area MEP ( Member of the European Parliament) Chris Davies and his PA Jackie Wilson, and they also show our members giving a cake to the driver , who was as surprised as the many passengers on the train ! And now for the even BETTER news ! ! 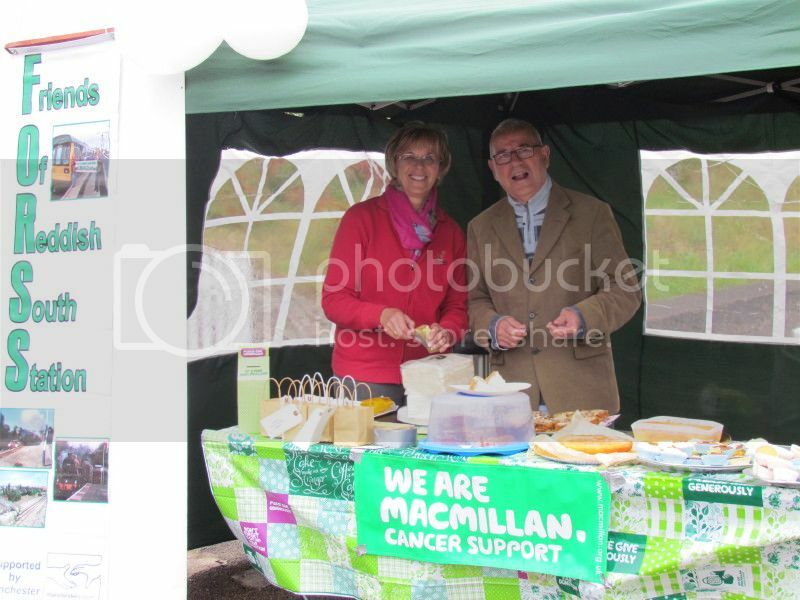 Well over £310 was raised for the Macmillan Cancer Charity. There is some more money to come in from a couple of pledges and a charity quiz, so the total is expected to be about £320. We will of course reveal the final amount later. This huge amount smashes last years total of £250 and Everyone at FORSS would like to Thank all those who provided cakes , buns , special quizzes, champagne, tomatoes and of course COFFEE for this great Macmillan Coffee Morning, and finally for all of you who turned up to give your hard earned money for this cause. Thank You ! The Grand Total finally came to £372 (19/10/13) This final figure now includes "ace" fundraiser Terry Rourke's last donations. Well Done Terry ! ! Special meeting Denton "Town Hall" Aug 13th 2013. A special meeting chaired by MP for Denton & Reddish Andrew Gwynne and attended by representitives from both Denton and Reddish South "Friends" groups, Councillors from Stockport, Reddish and Denton, Executive Leaders of both Tameside and Stockport MBC's and very importantly a representitive from Transport for Greater Manchester (TfGM) who is a Stockport Councillor. The main reason for the meeting was to draw attention to and to gain support for our joint campaign for rail services to and from Stockport and Manchester Victoria and beyond. many opinions and facts and figures were given and produced and basically everyone was agreed that this service is urgently needed on a very under used line to get people off our overcrowded, congested and painfully slow roads into central Manchester. The meeting was very encouraging for the campaign because we got 100% support from both Council Leaders Kieran Quinn of Tameside and Sue Derbyshire from Stockport MBC. Andrew Gwynne MP is obviously behind the campaign and speakers from both "Friends " groups and the many Councillors there all spoke up for such a service. It was all really very positive and the TfGM representitive was seen to be frantically taking notes , hopefully to be taking back to the main body of TfGM the enthusiasm, drive and support from everyone present that we need a passenger rail service to Manchester Victoria. It is now expected that another meeting will be held in October after the top people at this meeting have written to , spoken to and had their own meetings with TfGM on our behalf and Kieran Quinn the Executive Leader of Tameside MBC promised that he would report back to Andrew Gwynne MP of any progress he makes and would then re-convene the meeting. It is excellent news that so many top people are supporting our joint campaign and it is very encouraging that at last we might be beginning to persuade and showing the "purse strings" of all our transport needs and requirements in our region, TfGM. Apologies for not naming every Councillor or representitive there at the meeting, but there were simply too many to list ! Printed below is a copy of an e-mail sent from our MP Andrew Gwynne , who chaired the above meeting and it tells us his views and opinions about it, and indeed the progress of our campaign for passenger services. It makes interesting and encouraging reading. It was really great to get both the Friends of Reddish South Station and the Friends of Denton Station round the table to discuss our ‘missing piece of the jigsaw’ proposals with the Leaders of Stockport and Tameside Metropolitan Borough Councils. It’s so important to the success of the campaign that we get the full backing of the two local authorities and I was delighted that Councillor Sue Derbyshire and Councillor Kieran Quinn got fully on board with our aims. So where to next? Well Tameside and Stockport Council Officers are now speaking to each other with a view to both Councils taking a report to their respective Executive Cabinets in October to formally request Transport for Greater Manchester conducts a thorough and in-depth study into better utilising the line from Stockport through Reddish South and Denton, to Manchester Victoria and beyond. This is a major breakthrough because the two Councils, working together, have the capacity to drive our campaign up the agenda at TfGM. 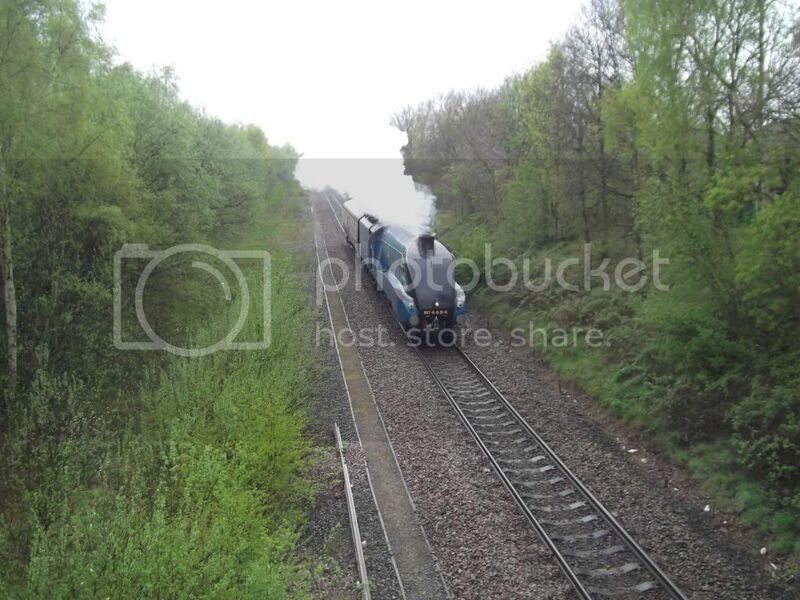 Very unusual train visits Reddish South. ! 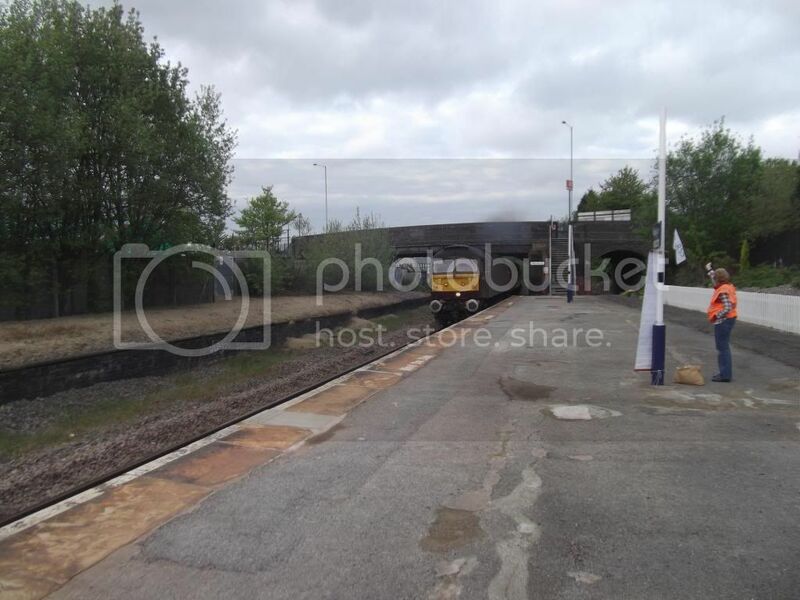 On Sunday Sept 8th a Trans Pennine Express special train stopped at Reddish South for a few minutes. The train actually turned out to be a "Branch Line Society" special charter operated by a Class 185 Trans Pennine Express DMU originating from Manchester travelling to York and back, via some rare passenger lines and many sidings and depots that are not normally used by passenger trains. 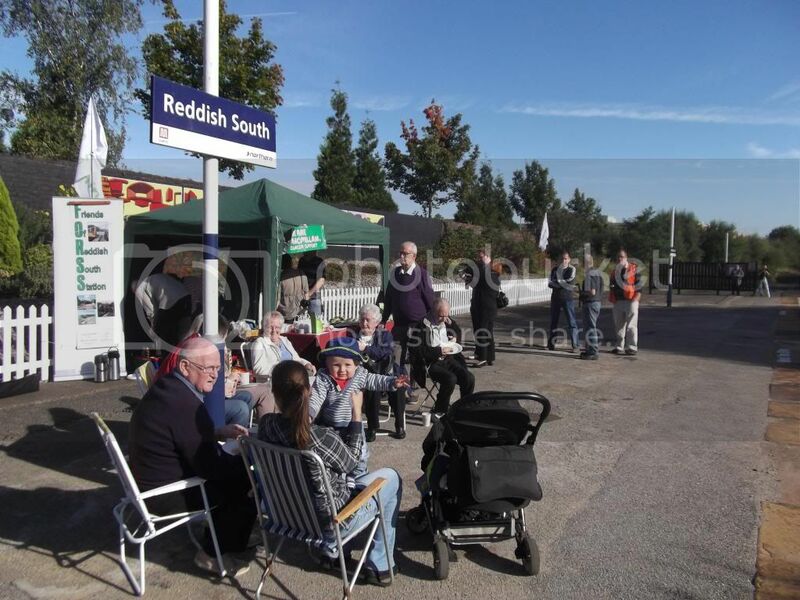 The society members are very knowledgeable railway enthusiasts and it was brilliant that they chose to visit Reddish South Station which hopefully soon will be host to regular passenger services and not just special charters. Unfortunately at the moment Reddish South can be classed as "rare" to the Branch Line Society because we only have one train a week ! After we got off the train on its return from Stockport it was realized that this had become the first time in almost 40 years that passengers had traveled from Reddish South to Stockport and back. Lets hope we don't have to wait another 40 years for the next train ! ! Railtour to Settle & Carlisle (Sept 11th) A report of this tour is now on our "News" page. A report of this tour is now on the "News" page. Stockport Station Open Day Aug 4th 2013. We had a great day out with our joint show stand with "Friends of Denton Station" , and their Chaiman Alan Jones, which was really well attended. We even had celebrity and rail enthusiast Pete Waterman at our stand who was really enthusiastic and supportive about our campaign. He also gave us some possible leads to more funding and supporting people and organisations and it was fantastic to get this moral support from such a well known rail person. 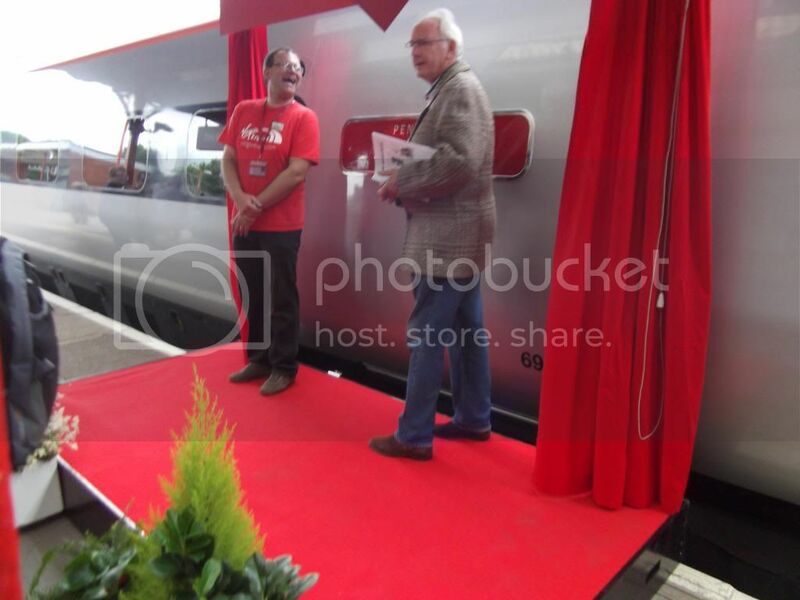 Pete Waterman was at the station event to officially name a Vigin Pendalino "Stockport 170" to commemorate the 170th anniversary of Stockport Station, and he gave a great speech about the station , Virgin Trains and the future HS2 Project. He is such an enthusiastic and knowledgeable person about railways and he got a fantastic round of applause from the large crowd. The show also featured many great railway stands and exhibits, particularly good were the model railway and tram exhibits and were all very well attended. Scarborough Flyer 2013. This steam train excursion passes through Reddish South every Friday until Sept 11th but DOES NOT STOP to pick up or drop off. To travel on this train you must board at STOCKPORT. We do however have 2 diesel hauled railtour excursions from Reddish South on Aug 31st and Sept 11th and full details of these excursions are on our "Events" page. 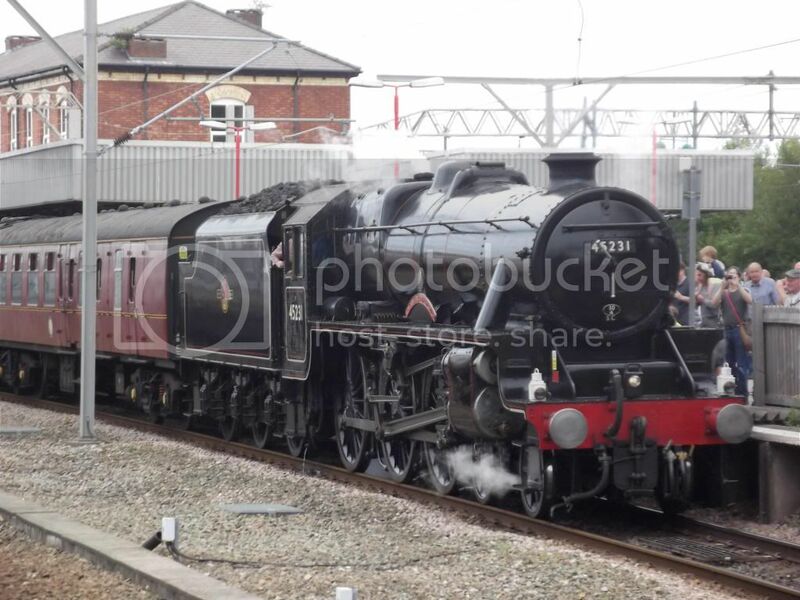 Below are photos of previous steam excursion trains that have passed through Reddish South and we hope to include some photos of this years locos which today Aug 2nd ,was A4 Pacific "Union of South Africa"
MP for Reddish Denton and Dukinfield Andrew Gwynne attends our "Redfest" event in Houldsworth Square where he updated us with the latest news about our campaign for services through Stockport Reddish South and Denton to Manchester Victoria. He told us that he was continuing to gain support from Stockport MBC and Tameside MBC to persuade TfGM that such a service is necessary , viable and important to the people around here. This is of course to improve transport links and to get motorists off our congested roads and onto a rail service that so far does not exist. He reiterated the fact that we at FORSS and FoDS must continue to lobby the members of TfGM for this service and that our surveys, reports and DVD's must continue so that TfGM will accept that we have a valid reason to be included in the next franchise agreement for this new rail service. Andrew Gwynne is pictured with Alan and Kim Burrows (FORSS Secretary) and Dot Ashworth (FORSS Treasurer). 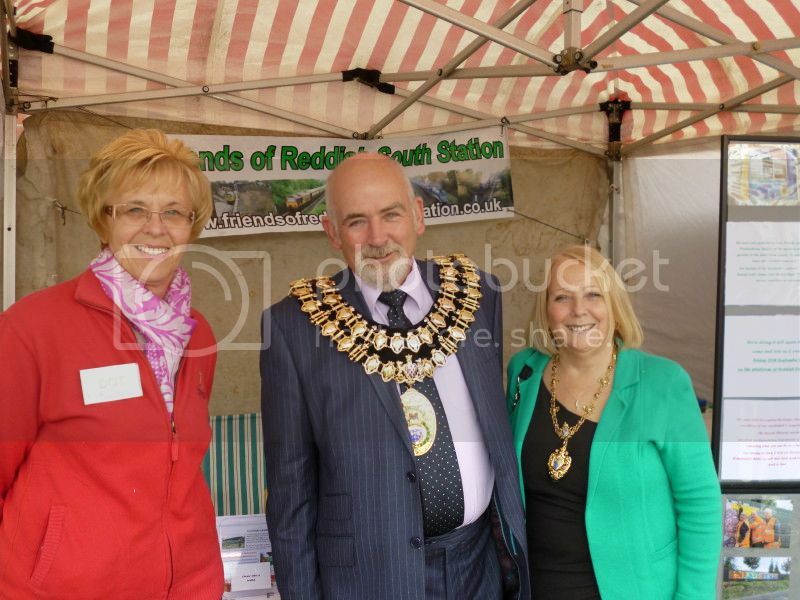 Stockport Lord Mayor Cllr Chris Murphy and Lady Mayoress Dot Murphy also attend our stand at the Redfest event and also lend their support to our campaign. We always welcome support from such important people along of course with all the many people who completed our survey that day. 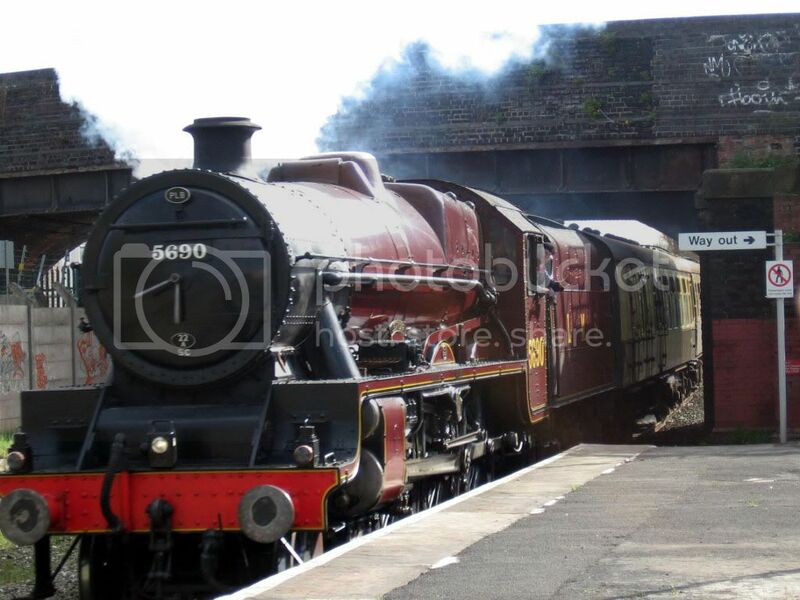 5th June 2013 Retro Railtours announce their 2nd railtour this year. ! ! This next tour will be to Norwich & Great Yarmouth. Full details can be found on our "Events" page. It will pick up and drop off, as the last tour did, at Reddish South. We now have 2 more railtours this summer from Reddish South ! 27th April "Retrorailtours" Cardiff/Swansea trip. 20th April 2013 Stockport Station "Survey"
Five members of the "Friends" group descended on Stockport Station in two seperate shifts on Sat 20th April to conduct a survey of travelling passengers with regard to services from Stockport to and from Manchester. The survey lasted from about 10:00 to 14:00 and the main questions were about possible new services to Manchester Victoria. It was pretty obvious even from a very quick analysis of the results that most people would prefer a choice of services to both Piccadilly and Victoria . It seemed that many people did not realise exactly where Victoria was and that many of them had been to the MEN Arena without knowing that it was Victoria Station that was next to it ! Many others said that they would use Victoria services to shop at the Arndale Centre almost opposite and to commute to Victoria as their workplace was much closer than Piccadilly so the free bus shuttle would not be necessary to get to work. Anyway a full analysis will be done and the results will be detailed here at a later date. Many Thanks to Lesley the Station Manager and to all the platform Staff at Stockport Station for their help and support to us for this survey. 14th April 2013 "Quiz Night"
News about our overall campaign for passenger services from Reddish South and Denton Stations has progressed quite favourably. A very important meeting chaired by local MP Andrew Gwynne and attended by Cllr Fender of TfGM (Transport for Greater Manchester) and representitives from the Reddish South and Denton Stations groups took place in Manchester at the HQ for TfGM Piccadilly, and the overall impression was given that our joint cause was justified. An agreement was reached for further meetings this time to be attended by all the above, plus Network Rail and Northern Rail to go into more details of the needs and reasons why we all need these services and possibly to see how further progress can be made. We cannot stress how much MP Andrew Gwynne was important and forceful at the meeting with TfGM who at first seemed to be dismissal of our campaign. This seems to be a very poor attitude given the chronic need for a passenger service along this line to alleviate the terribly congested road network in East Manchester. This attitude also fails to recognise the fact that such services would also benefit people from places like Chester,Hazel Grove, and Stockport who would like to travel to Manchester Victoria, the true heart of the City , rather than to Manchester Piccadilly and then have to get a free bus to the centre. Check out You Tube and you will find an excellent copy of Noel Henrys promotional DvD about the station and our efforts at getting services along the line to Manchester Victoria. 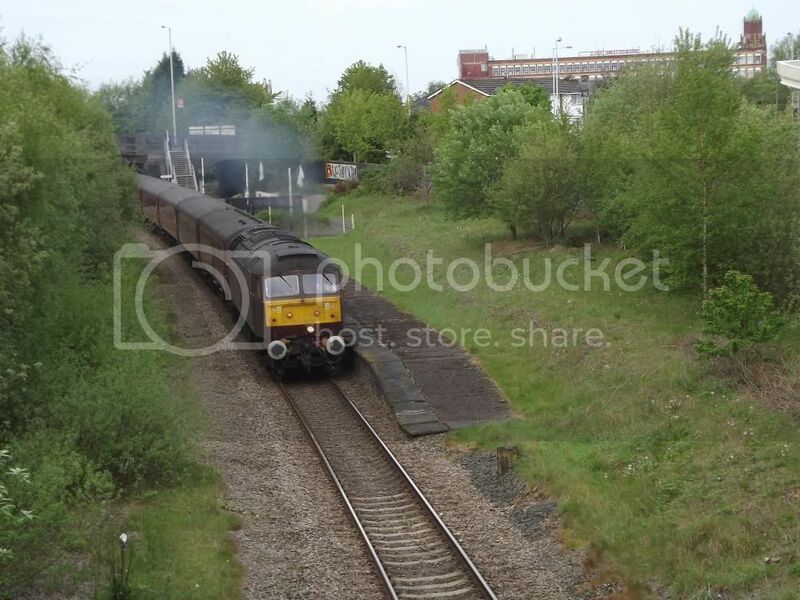 Also there are two snapshots of steam trains passing through Reddish South on special rail tour duties. Just search for "Reddish South" and enjoy ! Dec 21st. Jeremy Vine Show Radio . See the "NEWS" section for details of National Radio coverage ! Dec 16th. Christmas 2011 Folk Train. ! 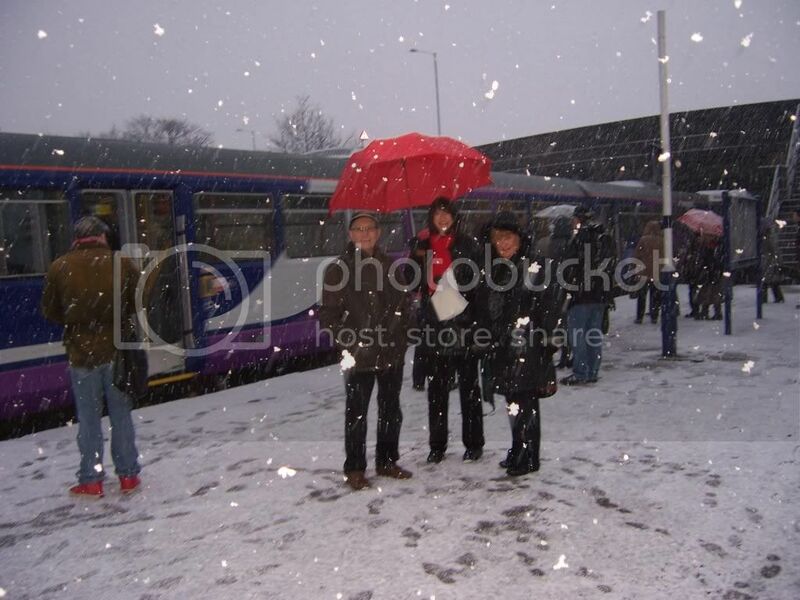 The first snow of the winter did not deter the 40 or so passengers on the Folk Train on Dec 16th, which is shown above. See the events page for a report about the train. Dec 6th. 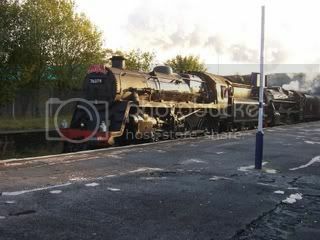 See our news "News" section for news of a great railtour stopping at Reddish South in Spring 2012. Nov 9th. ACORPs meeting House of Commons. Dave Ashworth was our representitive at the ACORPs meeting and here is his report. I went down to London on Virgin Trains from Stockport and then enjoyed a nice walk to Westminster in the late autumn sunshine, through Trafalgar Sq and Whitehall. The security to get in to the Houses of Parliament is incredibly tight, but was well organised and I was in and at the Members Dining room where the meeting was held within a few minutes. It started at about 4:20pm with a short welcoming speech by MP Ben Bradshaw, who then introduced the main speaker , The Rt Hon Teresa Villiers MP, The Minister of State for Transport. To cut a long speech short , she was very enthusiastic and supportive of Community Rail projects and highlighted some of the best and most improved lines in the country to support her views. Perhaps the most famous and certainly the best in terms of passenger number improvements is the branch from Truro to Falmouth in Cornwall, where the simple addition of a passing loop along the single track line plus some funding and re-scheduling of services, has boosted passenger numbers by over 90% in a year. I have to say that Mrs Villiers came over as being really enthusiastic and I would have loved to have shown her our promotional DVD ! Then we had similar kinds of speeches from Mark Hopwood of First Great Western and Richard Alan the Area Director (north and east) for Northern Rail. Again they sounded enthusiastic and interesting, but after briefly speaking to Richard Alan of Northern Rail afterwards, who was very dismissive of our particular campaign, and I have to say was quite rude, I was not sure of his motives. The formal part of the meeting was concluded by Neil Buxton the General manager of ACORPs, who sounded really excited that ACORPs had had a meeting in the Houses of Parliament attended by so many MPs and the Minister of State for Transport. ! We then all mingled and swopped ideas and plans and I met some very intersting members who had done some fantastic improvements to their lines and services. The best part was meeting Cyrus from The Friends of Denton Station and we both bent the ears of a nice chap from Northern Rail whos name escaped me. He was a Projects Manager at Preston and Blackpool who has done a lot of work with The Friends of Poulton-le-Fylde station to get a Station re-vamp , painting and even a new lift that has now seen a dramatic increase in passenger usage at Poulton. We have been promised a couple of free passes each for Denton and Reddish "friends" groups to go and see the improvements at Poulton-le-Fylde and to get some ideas what we could do if we got actual services. We can also meet some "Friends" from Poulton. This chap from Northern Rail was brilliant. He actually supported our causes at Denton and Reddish, he was positive, enthusiastic and certainly not rude like his more senior Northern Rail Area Director. I gave him one of our reports and DVDs and I expect this one will actually be read and viewed ! He also promised to sign our online petition and as the number went up , I think he actually did. ! I gave out many flyers and all the reports and DVD's and most of them went down really well. Hopefully we will get some much needed publicity for the campaign. Unfortunately apart from Andrew Gwynne MP, who of course is already on our side in a big way, I did not get a chance to bend the ears of other MPs as they all had to dash out to go and vote in a division in the House when the division bells rang half way through the general chatting. However flyers have gone out to ACORPs members in Cornwall Devon Essex and Derbyshire as well as to several from unknown affiliates. A great meeting , superb location, really nice food and drinks and even enough time to visit the actual House of Commons chamber itself . 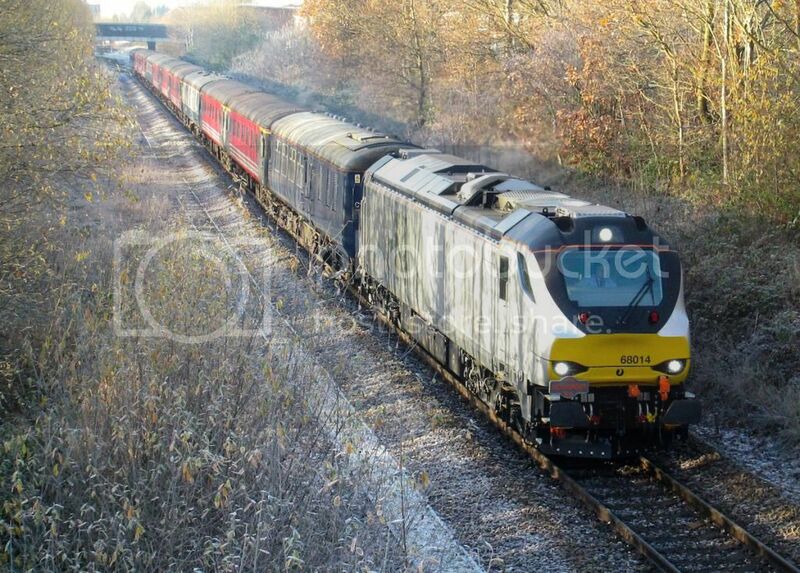 Nov 6th See the pictures section for photos of the latest railtour to pass through Reddish South yesterday, Nov 5th. 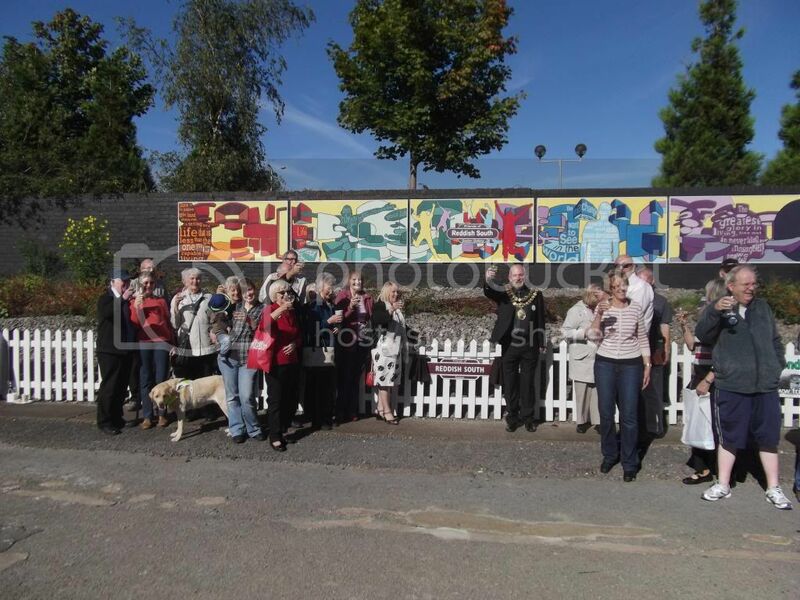 New Station Mural unveilled by MP Andrew Gwynne. Reddish South station is presently served by the once a week "Parliamentary" train know locally as the "Ghost Train" which runs every Friday. It runs one way to Stalybridge with request stops at Reddish South and Denton. The train leaves Stockport at 09:15 and calls at Reddish South at 09:26. 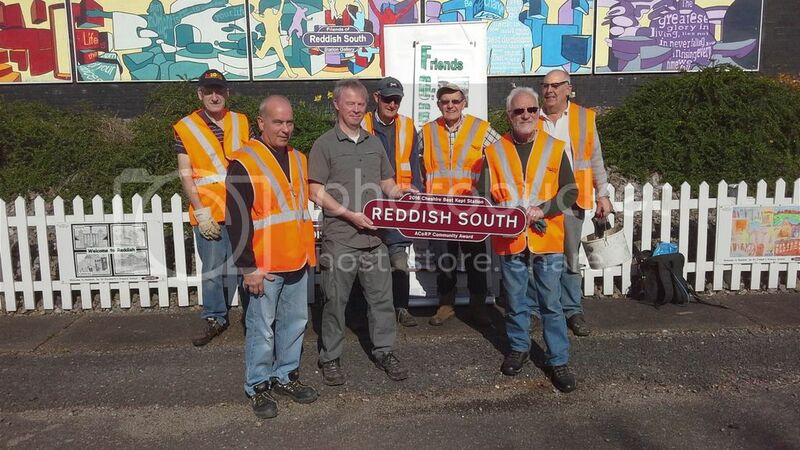 The "Friends of Reddish South Station" FORSS, were founded in 2007 with a handful of supporters and now have hundreds of people who have backed our campaign for proper passenger services to Manchester Victoria.The website will aim to keep you updated about the groups progress, will include pictures of the site, details of the next meeting, events etc. As a local resident and commuter I know that the Reddish, Gorton and Hyde road corridors are becoming increasingly congested we need to be thinking about alternative modes of transport to Stockport and Manchester. Ultimately the group fully supports the full re-opening of line with a decent timetable to Stockport and Manchester. It also wants to tidy the station and provide South Reddish with a tidy and maintained station. Please keep checking the site for further updates.